Aoki Mokubei was born in the Gion district of Kyoto as Aoki Sahei. From childhood, he was a disciple of the well known artist and Confucianist Kou Fuyou, who had a strong influence on his upbringing. When he visited Kimura Kenkadou of Osaka, he found among his book collection a book written by the Chinese Shuryuutei called “Guide to Ceramics”, which, it is said, inspired him to decide that ceramic art was his life’s calling. It is said that his mentors in ceramic art were Okuda Eisen, who taught him how to work porcelain, and Houzan Bunzou the 11th, who taught him how to work pottery, although it is also said that most of his knowledge was gained through self study. He set up shop in the Awata region of Kyoto. He took the name of the tea house run by his family, “Ki” (木), combined the characters of his nickname “Yasohachi” (八十八) into one character, “Kome” (米), and added them together to create the name “Mokubei” (木米), and worked under that name. With his natural genius, he became one of the most famous potters in Kyoto-Osaka after just a few years. In 1801, Tokugawa Harutomi of the Wakayama area heard of his fame and invited him to participate in the construction of the Zuishi kiln. It is said that this is when he was bestowed with the Silver Seal of Teiunrou, but there are differing opinions and no concrete evidence. In 1805, he was ordered to serve at Awata Palace. The next year, he went to Kanazawa, in Kaga Domain, and began working at Mount Utatsu. He briefly returned to Kyoto before going back to Kanazawa in 1807, where he established the Kasuga-yama kiln. After abandoning it to return to Kyoto, he stayed in Kyoto permanently and continued his pottery there. In addition to the Chinese and Choson styles, he researched many different styles of ceramic art such as European, Cochin ware, blue and white pottery, akae (enamel decoration on porcelain), Dehua pottery, and Mishima ware. He created a lot of tea utensils, focusing mainly on kettles, and those creations became the foundation for modern Japanese tea utensils, referred to today as "Mokubei style". In addition to pottery, he excelled in painting and Han Studies, had a sophisticated demeanor, and made close friends with many intellectuals such as Tanomura Rakuden and Rai San'yo. His representative work, “Bokutansai Sansui-zu” and other works have been classified as Important Cultural Properties of Japan. - the highest appraised market value of art was over 15,000,000 JPY. - the highest appraised market value of art was over 30,000,000 JPY. After losing his mother as a baby, Leach spent his early childhood in Kyoto raised by his father, a Japanese resident. He later returned to England, but came back to Japan in 1909 aged 21. Connecting with writers and artists from the Shirakaba Group, he was especially friendly with Yanagi Soetsu, and became captivated by ceramics. 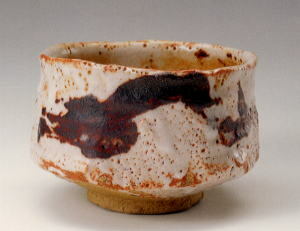 He began studying ceramics under Ogata Kenzan the 6th, producing Raku ware and so on. He endeavored in pottery techniques at Hamada Shoji's Mashiko kiln base, became acquainted with Kawai Kanjiro and participated with him in Yanagi's mingei movement. 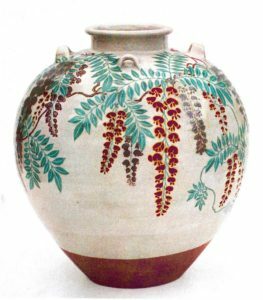 In 1920 he returned to England accompanied by Hamada, and established a Japanese style Noborigama kiln in St Ives, known as the Leach Pottery. Afterwards he went to and from Japan and England, working on pieces and developing unique works that fused Eastern and Western cultures. Leach was awarded an Order of the Sacred Treasure 2nd Class in 1966 and a Japan Foundation Prize in 1974. He passed away in 1979 aged 92. - the highest appraised market value of art was over 3,000,000 JPY. Born to the Ninth Generation Sogan, he lost both parents at a young age, then lost his home in the Great Tenmei Fire. Was able to restore his household in Ichijobashi with assistance from the Sanzen family among others. In addition to his trade of manufacturing Doburo tea kettles, he also had experience working with Seto, Annam, and Kouchi ware. In 1817 (14th year of the Bunka era), he adopted the name of Ryozen, with the character "Ryo" being taken from Ryoryosai Sosa of the Omote Senke school. Because the generational records, as well as the Sozen Seal that served as the symbol for each generation were lost in the Great Tenmei Fire, details and records pertaining to Ryozen's predecessors are less clear. 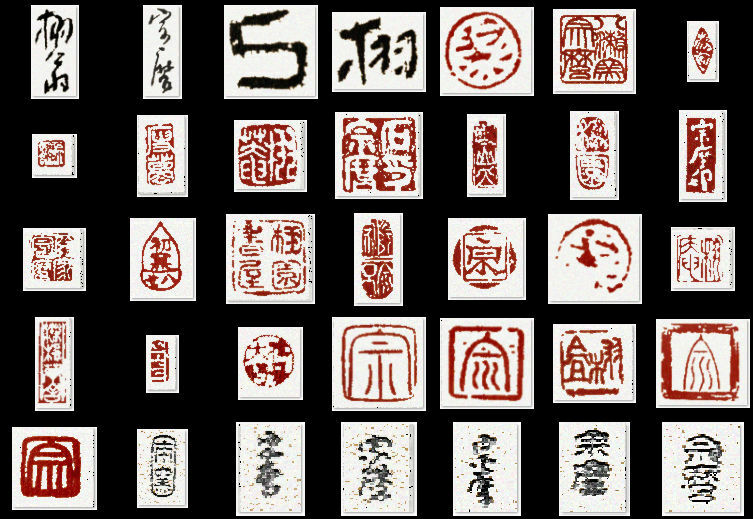 In the generations following Ryozen, the seals used were original, and became increasingly varied. At first, he was a "kasshiki", an attendant charged with announcing mealtimes to the monks, working under Daiko Sogen at Daitoku-ji Temple. However, with Daiko Sogen's help, he became an adopted child of Ryozen when he was around 12 or 13 years of age. After that, he researched the making of pottery, and in 1817 (14th year of the Bunka Era), he succeeded to the name of Zengoro. Then, in 1827 (10th year of the Bunsei Era), he, along with his father Ryozen as well as others such as Kyukosai Sosa and Raku Tannyu, were called upon by Lord Kishu-Tokugawa and engaged in Kishu Oniwayaki pottery. He was bestowed the signatures of "Eiraku" and "Kahin Shiryu" by Lord Harutomi, and since then he began to use "Eiraku" for his signatures, etc. In 1843 (14th year of the Tenpo Era), he left his business to his son Sentaro (who will later become Wazen) and took on the name Zennichiro. However, he left behind many remarkable works created even after this point in time. In 1846 (third year of the Koka Era), he was granted the name and signature of "Tokinken" by Prince Takatsukasa. In his later years, he took on the name of Hozen and proceeded to Edo. After that, he did not return to Kyoto and founded Konanyaki pottery at Omi. At one point, he was summoned by Lord Nagai of Takatsuki and was active in various regions in Takatsuki, making pottery such as blue and white sometsuke pottery. In terms of style, he mainly produced items used for tea and daily necessities, using styles such as the gold brocade kinrande style, blue and white sometsuke pottery, the Annan style, Cochi pottery and the Shonzui style. Eldest son of Hozen. He was very fond of Ninsei, and in 1852, he and his younger brother-in-law, Munesaburo (Kaizen) opened the new Eiraku Omuro Kiln on the remains of the Ninsei Kiln. Afterwards in the 14th year of the Tenpo Era (1843), he inherited the 12th generation name of Eiraku due to his father Hozen's retirement. After that, in the second year of the Keio Era (1866), he was invited by Maeda Toshinaka of the domain of Daishoji in Kaga, and he opened the Kutani Eiraku Kiln with Munesaburo and his son Tsunejiro (who would later become Tokuzen) in order to improve Kutani pottery. He engaged in this for six years. He also experienced suffering and such due to the debts left behind by Hozen, but he greatly endeavored even after this time. After returning to Kyoto, he changed his surname in 1872 (fourth year of the Meiji Era) to Eiraku (up until that point, his surname had been Nishimura and Eiraku was an alias) and two years later, he was invited to Okazaki in Aichi Prefecture and opened a kiln there. He created a wide range of pottery, mainly of the gold brocade kinrande style, the Nanking style, gosuakae red pottery and others and Western tableware etc. In his later years, he moved near Kodai-ji temple in eastern Kyoto and opened the Kikutani Kiln. It was from this point onward that he started to become hard of hearing, and he began to call himself "Jiroken" which is a name that includes the words, "deaf ears." His style has a wide breadth, including the Ninsei style, the gold brocade kinrande style, akae red pottery, Cochi and celadon. He also created his own techniques, such as using gold leaf in the gold brocade kinrande style, compared to Hozen, who instead used gold paint. He died on May 7th, at 74 years of age. - the highest appraised market value of art was over 60,000,000 JPY. After graduating from art school ad being admitted to the Ministry of Education, Culture, Sports, Science, and Technology’s industrial arts engineering training center, Fujimoto entered into an apprenticeship under Kato Hajime, and began producing works alongside Tomimoto Kenkichi as his pottery assistant in 1938. 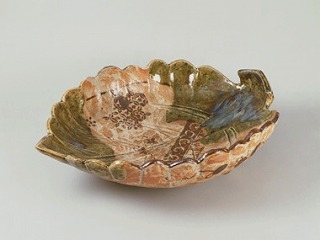 Fujimoto won the Kofukaiten Kofukai Kogeisho Award in 1938, and after World War II exhibited works primarily in the various exhibitions held by the Japan Ceramics Society. Fujimoto won an award from the society as well as the silver prize from the International Academy of Ceramics in Geneva in 1956. 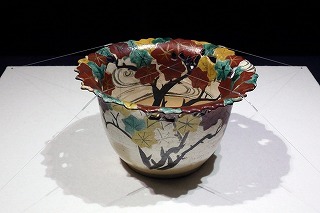 Furthermore, though Fujimoto for a time was a member of the avant-garde Sodeisha Society where he produced odjet d’art ceramics in addition to other kinds of pottery, from the mid 1960s he returned to more traditional styles, immersing himself in research of painted porcelain. Developing works that feature the motifs of flowers and birds, painted with such realism that’s evocative power superseded that of Nihonga artists. 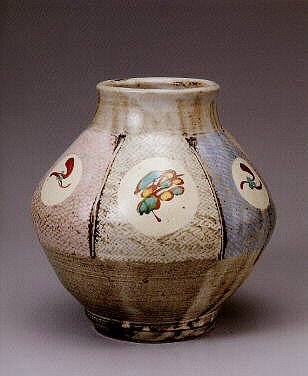 In addition to this, he created unique techniques such as that of Yubyokasai wherein images are added to works before firing via colored glazes, and it was for these techniques that he was designated as a holder of the title Nationally Important Intangible Cultural Property (Living National Treasure) in 1986. In the interim however, after assuming a position as an instructor at the Kyoto City University of Arts in 1956, he continued to dedicate himself to his own education and guidance of a new generation of artists at the school in Kyoto as well as at Tokyo University of the Arts until 1990 (ending his tenure as dean of Tokyo University of the Arts), while also winning awards such as the gold prize from the Japan Ceramics Society and a Medal of Honor from the Government of Japan with a dark blue ribbon in the same year. For his seal, he is fond of suing the Kuma or bear seal made by Kenkichi. Starting out with a passion for literatary studies, Fujiwara began submitting haiku and poems throughout his elementary and junior high school years to various publications and winning awards for some of his submissions. Leaving for Tokyo at the age of 19, he began working as an editor for Hakubunkan while also attending university and was producing poems under the pen name Fujiwara Keiji. However, due to poor health, he abandoned his aspirations of becoming a writer of literature and returned to his hometown in 1973. After returning home, Fujiwara began to practice pottery at the suggestion of Manyoshu scholar Masamune Atsuo, going on to become the apprentice of Bizen potter Mimura Umekage. Getting his first kiln in 1939, Fujiwara then started out on his own, and thanks to the guidance of Kanashige Toyo as well as deepening his understanding of the unique ko-bizen style of pottery, he developed works in the solemn style of Momoyama and Kamamura period ceramics. After the war he was recognized as a conservator of bizen ware techniques in 1948, was designated an Important Intangible Cultural Property by Okayama Prefecture in 1954, became a regular member of the Japan Kogei Association in 1956, and in 1970 became the second person to be designated a Living National Treasure for bizen ware pottery after Kanashige Toyo. In addition to this, he was awarded the Order of the Rising Sun 4th Class in 1972, received the Miki Memorial Award from Okayama Prefecture in 1973, and was also awarded the Order of the Sacred Treasure 3rd Class on the day of his death in 1983. Born as the second son of Living National Treasure Hamada Shoji, Shinsaku moved with his family to Mashiko, Tochigi Prefecture when he was only several months old. It was here that he developed an interest in pottery, and it was in junior high school that he committed himself to carrying on his father’s legacy by becoming a pottery. Around 1950, at the same time as when he graduated from university, Hamada began his own training in pottery in his father’s workshop. In 1963, he served as an assistant to his father and Bernard Leach as they toured America giving lectures in ceramics. After this, he exhibited his own pieces in his father’s private exhibitions as well as in Kokugakai exhibitions. He became a member of the Kokugakai in 1978, and though he did produce work while a member, he eventually resigned from the organization in 1992 and now puts on his own private exhibitions in department stores and galleries in various locations as an independent artist. In addition to this, he was awarded the grand prize at the Salon de Paris in 1987, and is now a member of the society. Taking on the simpler aspects of folk ceramics such as using iron, ash, persimmon, and salt glaze, he also serves as an official expert on his father Hamada Shoji and Bernard Leach’s works. - the highest appraised market value of art was over 1,000,000 JPY. A kiln of Mashiko-ware pottery headed by Hamada Shoji. Since establishing the kiln in 1931, Hamada and his disciples have presented many works in succession using Mashiko traditions and materials. Mashiko's recent rise to prosperity as a major production area for folk-craft ceramics has been greatly influenced by the ceramic-making activities of this site. Hamada's achievements were recognized in 1955, when he was designated as the first individual holder of Intangible Cultural Property (Living National Treasure). Following his death, Hamada's son Shinsaku took over the kiln and has been teaching highly reputed potters. An aspiring potter, Hara Kiyoshi became an apprentice of Ishiguro Munemaro in 1954, later studying under Munemaro's top disciple Shimizu Uichi. 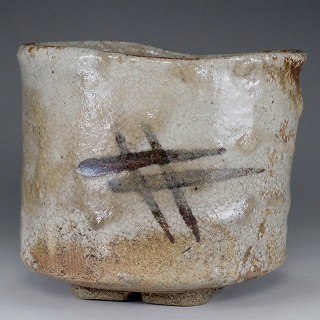 He opened his own kiln in Setagaya, Tokyo in 1965, after previously participating in the Japan Traditional Kogei Exhibition for the first time in 1958 and becoing a regular member of the Japan Kogei Association in 1961. After opening his own kiln, he was conferred the Chairman's Award at the Japan Traditional Kogei Exhibition in 1969, the Japan Ceramic Society Award in 1976, and the Tokyo Governor's Award at the Japan Traditional Kogei Exhibition in 1997. He was also very active arranging solo exhibitions at Mitsukoshi Nihonbashi and elsewhere as well as producing a broad range of works for exhibitions at home and abroad that he was invited to. From the beginning, Kiyoshi experimented with iron glazes, underglazing plants, birds, and animals in iron on dark-brown glaze to create elegant and strikingly unique works. 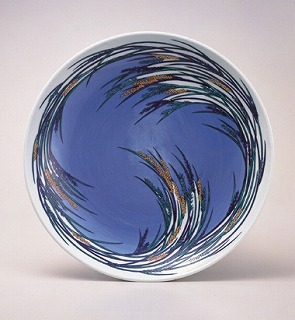 From the 1980s, he began making blue-glazed pieces characterized by their lucid blue color. He was a special invitee to the Japan Traditional Kogei Exhibition in 2001 and was recognized as a Holder of National Important Intangible Cultural Heritage (Living National Treasure) in 2005 for his glazed porcelain. Samurai and ceramic artist during the late Edo Era. Born in 1772, he was a member of the Owari Nagoya Clan. Hirasawa enjoyed the tea ceremony, and made teaware in the koseto and karatsu styles in his free time. His creations had a unique quality and were known as Kuroyaki. He died at the age of 69 on June 23, 1840. His name was Kazusada. His alias was Seikuro. Also Konjyakuan. The eldest son of Imaemon XII, Imaemon XIII studied at Arita Technical School and Tokyo Schhol of Fine Arts before returning to his hometown to study pottery under his father. 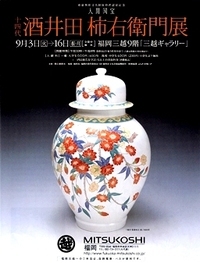 After his succession, Imaemon XIII arranged solo exhibitions in various locations to commemorate the occasion, and in 1976 he established the Ironabeshima Technique Preservation Society (Important Intangible Cultural Heritage) together with highly skilled potters in his studio. Subsequently, he continued to preserve tradition while also incorporating new techniques in his constant quest for modernistic pottery. He participated in traditional arts exhibitions and other public exhibitions as well as contributed to the development of local society and the training of a new generation. Throughout the years, he was conferred numerous awards and commendations, such as the Japan Ceramic Society Award in 1976; the Saga Arts and Culture Award in 1979; the West Japan Culture Award in 1984; the Medal with Purple Ribbon, the Saga Award for Distinguished Service, and the Saga Newspaper Culture Award in 1986; as well as the Mainichi Arts Awards and the 1st MOA Okada Mokichi Grand Award in 1988. He was also recognized as a National Important Intangible Cultural Heritage (Living National Treasure) in 1989, received the Japan Ceramic Society Gold Award in that same year, and was conferred the Order of the Rising Sun, 4th Class in 1999. Imaemon XIII held solo exhibitions not only in Japan but also in Spain, Portugal, and Paris, where he was very well received. In 1995, he received the Commendation Award of the Japanese Foreign Minister for his contributions to international cultural exchange. He inherited the traditional Ironabeshima technique, but from the beginning his aim was to achieve a modern style of pottery. Based on the "fukizumi" technique of spraying a gosu-blue glaze, he developed the "usuzumi" and "fukigasane" techniques, new to the Imaemon tradition. It is this expressiveness that has earned the modern Imaemon his high praise. - the highest appraised market value of art was over 6,000,000 JPY. Born into an old potter family, he trained next door at the Kakiemon Workshop. After beginning an independent career, he earned awards, starting in 1958 at the Saga Prefectural Exhibit, the Seibu Crafts Exhibit, the Issuikai Exhibit, and the Japanese Traditional Crafts Exhibit. In 1987, he was awarded the Minister of Education, Science and Culture Award at the Japanese Traditional Crafts Exhibit. In the meantime, he was appointed a professor at the Saga Prefectural Ceramics University and applied his energy to teaching young potters as well. In 1986, he received the Saga Prefecture Traditional Culture Distinguished Service Award, in 1990 he was recognized as a holder of Saga Prefecture's Important Intangible Cultural Property, and in 1995 he earned the honor of being a holder of National Important Intangible Cultural Property (National Treasure). His style is based on white porcelain and displays exceptional craftsmanship with the warmth of flower-patterned engravings and blue glaze. He is highly esteemed as one of the standout porcelain potters. 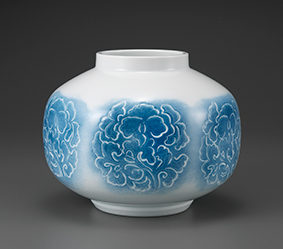 Pots with a blue-and-white glazed "Manji" signature are produced by his workshop, while those inscribed with "Manji" without a glaze are recognized as his original works. Born the second son of famous craftsman, Isezaki Yōzan, Isezaki Jun learned pottery from his father at a young age alongside his older brother Misturu, and began making pottery in earnest after graduating from university. In 1961, he was selected for a prize in the Japan Traditional Art Crafts Exhibition for the first time, and after continuing to be selected since then, was inaugurated as a full member of the Japan Art Crafts Association in 1966. In 1967, he built a kiln and became an independent craftsman. In 1977, he traveled to the United States and broadened his horizons to making sculpted pottery as well, represented by his display of an ambitious stance towards contemporary objet d'art pottery, such as taking charge of the Bizen ware relief mural decorations in the main entrances of buildings including the Prime Minister's residence, Bizen City Office, Kurashiki Notre Dame Memorial Museum etc. 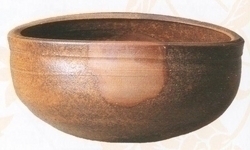 While he was regarded highly since long before for his yohen firing techniques, such as the hidasuki pattern, in recent years he has developed pieces that are clearly different from existing Bizen ware, such as works of sculpted pottery that mixes the yohen firing effects unique to Bizen ware with black glaze. In 2004, he was appointed the fifth National Important Intangible Cultural Property (Living National Treasure) of Bizen ware. 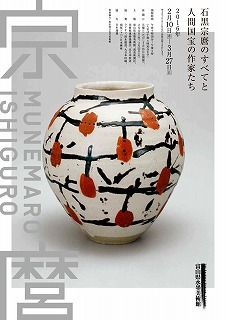 Ishiguro Munemaro roamed areas such as Tokyo, Saitama, Toyama and Kanazawa as he created his pottery works, before building a kiln at Ohara, Kyoto and settling down in 1935. He then became close to individuals such as Koyama Fujio, Katō Hajime, Kaneshige Toyo, Arakawa Toyozō and Katō Tōkuro and founded the Tōri Society and the Kashiwa Society among others. His style was of free-spirited expression, and he showed outstanding talent in fields such as black glaze, iron glaze, iron painting, temmoku glaze, Karatsu ware, overglaze enamel and ash glaze. 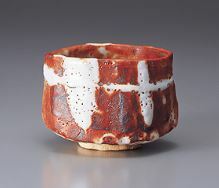 In particular, he was acknowledged as a holder of cultural property with his temmoku glaze in 1953. Then in 1955, he was acknowledged as an Important Intangible Cultural Property (Living National Treasure) with his iron glaze pottery works. Graduated from Tokyo Art School (Tokyo University of the Arts) in the Sculpting Department. Learned alongside students such as Okakura Tenshin and Takamura Kōun. He built a home at Tabata which also doubled as a workshop, and after installing a downdraft style kiln, he devoted himself to creating pottery in order to utilize the fruits of the research on pottery he had engaged in up until that point. 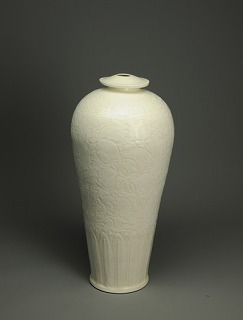 In 1907, he exhibited his work, "Jisei Kinshimon Kesshoyu Vase" at the Tokyo Industrial Exposition and won third place prize. After winning many prizes, he was appointed an Imperial Household Artist in 1934. In 1945, his home and workshop was burned down in the Bombing of Tokyo. He temporarily evacuated to his hometown of Shimodate before rebuilding a workshop in Tabata again in 1950. In 1953, he became the first potter to receive the Order of Culture. In 1955, he declined the offer to be designated as a Living National Treasure. As a potter who studied the foundations of art, he is a pioneer for establishing contemporary pottery art that is different from traditional pottery. His representative works include, "Hokosaiji Chinkamon Vase" (property of Sen-oku Hakuko Kan Museum, Important Cultural Properties), "Saiji Enjumon Vase" (property of Idemitsu Museum of Arts), "Saiji Kinkamon Vase" (property of Tsurui Museum of Art), etc. - the highest appraised market value of art was over 100,000,000 JPY. 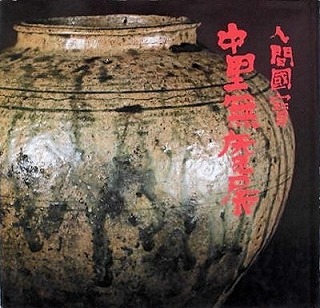 Born into a family of traditional Mumyoi-yaki potters, while inheriting the method for making traditional Mumyoi-yaki pottery and creating pottery full of contemporary feeling , in 1980 he won awards at the Traditional Crafts New Work Exhibition and the Japan Traditional Art Crafts Exhibition. 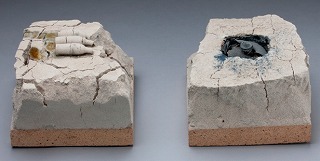 In 1985 he won Japan Ceramics Exhibition's Best Work Award, and in 1987 he won the Japan Ceramic Association Award. With his traditional technique incorporating unique color variations known as "Mumyoi youhen" and the kneading technique known as "Mumyoi kneading", the outward appearance displays the originality of Ito Sekisui V. Also, further spreading the potential of Mumyoi-yaki, in 2003 he was recognized as a nationally designated Important Intangible Cultural Property (Living National Treasure). Born into the Kaneshige family, one of the six kilns of Bizen, as the son of wakigama-style potter Kaneshige Baiyo, Toyo was trained by his father from early childhood and became adept at pottery techniques, with handicrafts and engraved ornaments being his particular specialty. He further devoted himself to the study of kiln construction. In 1921, he built a German-style map kiln, allowing him to successfully fire kiln-effect pottery (yohen-mono). He went on to study pottery clay as well, successfully recreating the sheen of Momoyama-period Bizen pottery in 1930. In 1939, he also succeeded in firing scarlet-stroke (hidasuki) kiln-effect pottery. In this way, he devoted himself to the restoration of traditional Bizen pottery and became the founder of modern Bizen pottery. Also in this period, he held his first solo exhibition in 1936; founded the "Karahine Society" together with Arakawa Toyozo, Miwa Kyuwa, and Kawakita Handeishi in 1942; was certified as an Authorized Preserver of a Craft also in 1942; was selected as an Intangible Cultural Heritage in 1952; founded the Tori Society in Tori, Izusan, together with Ishiguro Munemaro, Kato Hajime, Arakawa Toyozo, and Kato Tokuro in 1954; and was certified as an Important Intangible Cultural Heritage (Living National Treasure) for his Bizen pottery in 1956. First studied design etc., under pottery art designer Hino Atsushi, afterwards working at Gifu Prefectural Ceramics Research Institute and starting to create pottery on the side in 1926. In 1927, he was selected for a prize for the first time in the eighth Exhibition of the Imperial Fine Arts Academy in the fourth category, the Industrial Art Category, which was newly established in the same year. Since then, he continued to exhibit his works, and took on the name "Hajime" from 1930. Additionally, he received the Grand Prize at the Paris International Exposition in 1937, and in 1940, he built a kiln in Yokohama and focused on researching the glaze of China's Ming Dynasty, creating a fusion of it with Seto glaze and receiving the Chunichi Cultural Award in 1952. In 1954, he established the 'Touri Society' in Touri, Izusan with Ishiguro Munemaro, Kaneshige Toyo, Arakawa Toyozo and Kato Tokuro. Furthermore, he left contributions in the research of porcelain as well, such as red-figure, white porcelain and celadon porcelain. 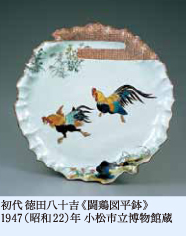 In 1957, he was acknowledged as a preserver of the overglaze technique, and was then acknowledged as a Preserver of Important Intangible Cultural Property (Living National Treasure) in 1961. Worked at Gifu Prefectural Ceramics Research Institute, active as a chief technician while producing his own works on the side. He continued to enter and be chosen for prizes for his works in various exhibitions and was inaugurated as a full member of the Japan Art Crafts Association in 1966. 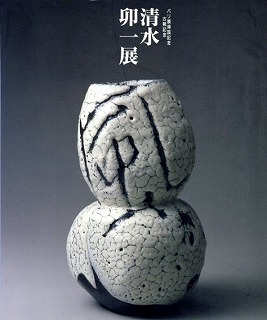 He received numerous awards such as an award of excellence for his "Iron Glaze Pot" in the Asahi Ceramic Art Exhibition in 1967, the Asahi Prize for his "Iron Glaze Flower Vase" in the 15th Japan Traditional Art Crafts Exhibition in 1968, the Japan Ceramic Society Prize in 1985 and the Tokai Television Cultural Prize in 1994. In 1995, he was acknowledged as a Gifu Prefectural Designated Intangible Cultural Property, and he was chosen for the Chunichi Cultural Award in 1998. In 2010 (22nd year of the Heisei Period), he was designated a Living National Treasure (Nationally Designated Important Intangible Cultural Property) for Setoguro ware. He often produced works such as traditional Shino ware, Kizeto ware and Setoguro ware using an anagama kiln of a semi above ground style. 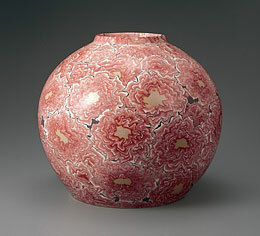 Shino glazes are distinctive for their vivid red coloration, and they were known as his most representative works. However, his Setoguro works of recent years also have a sense of presence enough to be on the same level as them or more, and express a dignified taste. Was born the oldest son of the fifth generation Kato Kobei, and trained at the Kyoto Ceramic Research Center after graduating from Tajimi Technical School. However, he was drafted during the war and was also a victim of the atomic bombing of Hiroshima. He was unable to make a comeback for a while, but he resumed creating pottery from 1955, and he was selected for a prize for the first time in the 13th Japan Fine Arts Exhibition in the following year. In 1961, he received an invitation from the Finnish Government and studied abroad at the Finnish School of Arts and Crafts. During his studies there, he traveled to areas in the Middle East such as Iran and became interested in Persian glaze pottery there. From that time onward, he devoted himself to researching Persian glaze. After returning to Japan, in 1963 (with a Sancai piece) and in 1965 (with an oil spot tenmoku piece), he received the highest honors in the Japan Fine Arts Exhibition and the Hokuto Award. In 1964, he received the Contemporary Arts and Crafts Award (with a Jun ware piece) in the Japan Contemporary Arts and Crafts Exhibition. Along with creating pottery, he also often took part in the excavation and research of ruins in Iran on the side. He continued his research on Persian glaze, and after over 20 years of trials, he successfully recreated a type of Persian glaze, lusterware, that had died out since the 17th Century. 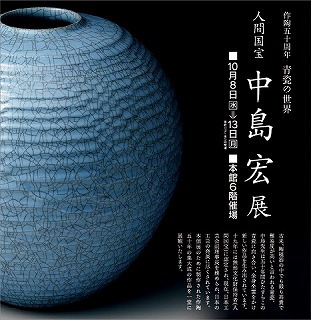 In 1982, 1988 and 1995, he received the Ministry of Education Award all three times in the Japan Art Crafts Exhibition. In 1991, he received the Japan Ceramic Society Gold Prize. In 1993 he received the MOA Okada Mokichi Award and his lusterware piece was evaluated highly. In terms of commendations, he was acknowledged as a Gifu Prefecture Important Intangible Cultural Property and a Tajimi City Intangible Cultural Property in 1983. He received the Medal with Purple Ribbon in 1988, and in 1955, he was acknowledged as a Nationally Designated Important Intangible Cultural Property (Living National Treasure), Honorary Citizen of Tajimi City and Honorary Citizen of Gifu Prefecture. Apart from his lusterware pieces, he excelled in the coloration technology of Sancai glaze and he handled the restoration work of the Sancai in Shosoin at the request of the Imperial Household Agency. He was acknowledged as an Important Intangible Cultural Property due to his Sancai techniques. Kato Tokuro was born the eldest son of Seto potter Kano Sojiro, and as a child displayed a talent for painting in the Nanga style, for composing Chinese poetry, as well as for ceramics, which he practiced under his father. In 1914, he was granted partial rights to his father's round kiln, marking the start of his own kiln construction and ceramics. In 1918, he married Kato Kinu and took the family name Kato. He devoted himself to surveying the old Seto kilns and researching traditional Seto techniques, allowing him to reproduce Shino and Oribe ware. In 1929, he founded the Society for the Surveying and Preservation of the Old Seto Kilns. In 1930, he qualified for the Art Aichi Society Exhibition and began associating himself with fellow promoters of folk art movements, such as Yanagi Muneyoshi, Kawai Kanjiro, and Hamada Shoji. After the war, Kato founded and became the first chairman of the Japan Ceramics Society in 1947, formed the Tori Society together with Ishiguro Munemaro, Kaneshige Toyo, Arakawa Toyozo, Kato Hajime, and others in 1954, and won the Chunichi Cultural Award in 1956. Tokuro became a director of the Japan Kogei Association in 1957 and a lecturer at the School of Letters, Nagoya University in 1958, but completely withdrew from any public work after the Einin Pot Scandal of 1960. Instead, he devoted himself to the free pursuit of ceramics as an unaffiliated potter. In 1961, he was even bestowed the pen name Ichimusai by poet Hattori Tanpu, after which he signed works Ichimusai or Ichimu. Moreover, although he was designated as the 1st Intangible Cultural Heritage Technician (today referred to as Living National Treasure), he was stripped of this after the Einin Pot Scandal. A master of potter's wheel techniques, Tokuro recreated the Shino and Oribe ware of the Momoyama period by restoring that period's clays, glazes, and kilns as well as devoted his life to creating reference material on ceramics, such as the Encyclopedia of Japanese Ceramics (Kodansha). After such a long life of contributions to the world of ceramics, he completed his own Akane-Shino in 1977. His sons include eldest son Okabe Mineo and third son Kato Shigetaka. 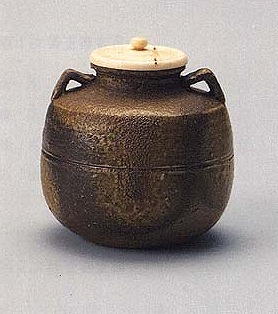 The Einin Pot was an earthenware pot that Tokuro had marked as coming from the Einin period (1293–1298) in 1937, which was later designated as a Important Cultural Heritage in 1959 through the strong promotion of Koyama Fujio. 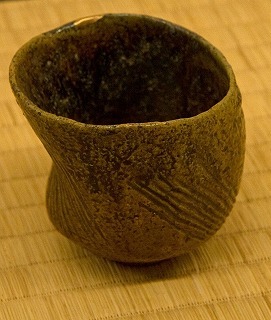 It was then discovered that the pot was not from the Einin period but made by Tokuro. 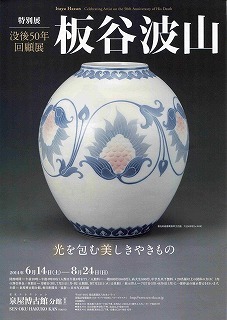 Since the pot was included in a ceramics dictionary edited by Tokuro himself, this incident developed into a fraud scandal that shocked all of Japan, but Tokuro's ability to imitate the ceramics of that period so skillfully has also been highlighted since. Ryoji is an author known as a potter who has produced a great number of abstract works and who continues to gain recognition not just in Japan, but globally. He holds exhibitions in Japan and all over the world. He uses materials and techniques for his works that are utterly different and unique. The appeal of his dynamic and yet subtle style is its constant creative urge, pursuing the possibilities of what can be made from clay and fire. At the same time, his touch can also be felt in his smaller works, such as tableware, and his fans are always fascinated by what he will create next. Takekazu began studying pottery making under Kawai Kanjiro, his uncle, in 1927, and received his guidance over the course of the nearly 40 years until Kanjiro's death. 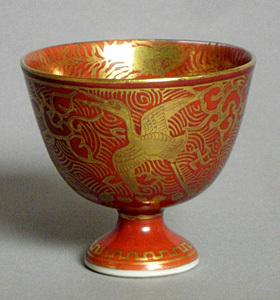 He inherited mingei techniques such as gosu porcelain, cinnabar lacquerware, and ameyu and kakiyu glazes from his uncle. During this period, he worked as an assistant to Bernard Leach, who was visiting the Kanetani kiln (Kanjiro's workshop) in 1935, and sought guidance at his side. In 1964 he traveled to Australia and New Zealand, holding one man exhibitions and classes in Sydney, Melbourne and Wellington. A three man exhibition along with Kanjiro and Kanjiro's son Hiroji was held at Tokyo's Takashimaya Department Store in 1966. In 1978 he toured with a commemorative 50th anniversary pottery exhibition at Takashimaya stores in Tokyo, Osaka, Kyoto, Okayama and Yokohama. Much like Kanjiro and Hiroji, Takekazu's pieces have no signature. A wealthy cotton merchant from Ise born to the Kawakita Kyudaku household, he was separated from his parents and became the head of the family at around 1. He took the name of Kyudaku the 16th, and received training in Zen and so on from his grandmother (what is currently called "emperor studies"). After graduating from Waseda University, he took on his father's occupation, also working as a Hyakugo Bank board member in 1903 before becoming Hyakugo's president in 1919, and its chairman in 1945. He also served as a member of the Mie prefectural assembly. 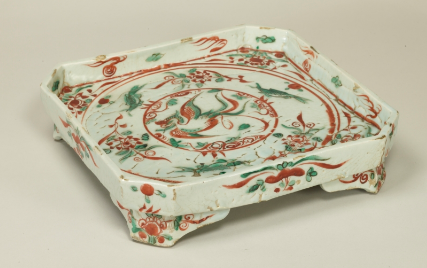 During this time he also showed a wide ranging talent for ceramics, calligraphy, and painting, particularly ceramics. He began making Raku ware in 1912, and opened a coal furnace at his home in 1929. In 1934 he built a Noborigama kiln of his own design, and held a one man show at Rosanjin's Hoshigaoka-saryo restaurant. He also formed the "Karahine Kai" group with Kaneshige Toyo and Arakawa Toyozo in 1939, and established the Hironaga Toen studio in 1946. He put particular effort into tea bowls, but rather than formal molds or expressions he would develop pieces with free expression, using an abstracted Buddha motif in calligraphy and paintings and so on to develop a unique world. They are currently highly valued on the market. In 1924, Kinjo joined craftsman Arakaki Eitoku's pottery workshop in Tsuboya. The same year, he struck up an acquaintance with Hamada Shoji, who was staying in Okinawa; they forged a lifelong friendship. In 1946, with a goal of reviving traditional Ryukyu pottery, he opened his own kiln in Tsuboya. He began to exhibit in the Crafts division of the Kokuten exhibition of Japanese art in 1955; in 1956, he won the Newcomer's Award, and in 1957, he took home the Kokugakai Prize. In 1972, he opened a kiln in Yomitan; the same year, he was named an Important Intangible Cultural Asset of Okinawa Prefecture. In 1977, he was awarded the title of Contemporary Master Craftsman by Japan's Minister of Labour. In 1981, he was awarded the Order of the Sacred Treasure 6th class; in 1985, he was named a National Important Intangible Cultural Asset (Living National Treasure). In aiming to revive traditional Ryukyu pottery, Kinjo created ceramics that exhibited a unique warmth, featuring designs such as abstracted fish and shrimp using relief techniques. He developed work that combined function and beauty, and he was highly esteemed as a pioneer in the field of Okinawa ceramic art. He is succeeded by his eldest son, Kinjo Toshio. In 1738 (Year 3 of the Genbun era), the first Rokubei was born as Koto Kuritaro in Yosumi Village in the Shimakami District of Settsu Province (modern day Takatsuki, Osaka), son of the farmer Koto Rokuzaemon. During the Kannen era (1748-51) he studied pottery making under Ebiya Seibei in Gojozaka, Kyoto. Afterwards, in 1771 (Meiji era year 8) he became independent and took the name Rokubei. Through the "Kiyomizu" seal he received from his teacher Ebiya Seibei, he came to be called Kiyomizu. He was awarded a seal with the character 清 (pure) to use as his mark as well as the pen name "Gusai". The first works were primarily tea cups, making use of his specialty characteristic Kaname and Herame patterns. He expanded to create Shigaraki, Seto-lacquer (iron lacquer), Gohon, and blue and white porcelain works. Prince Miyamasa Hitonori of the Myoho Temple commissioned him to make black Raku ware tea cups, for which he recieved the "Rokume" seal. He was thus added to the prince's culture salon, where he became acquainted with artists Maruyama Okyo and Matsumura Goshun, and the writers Ueda Akinari and Murase Kotei. He undertook making literary-styled tea sets for Akinari and Kotei, and in his later years was highly praised for his Ryoro teapots. He died in 1799 (year 11 of the Kansei era). Presently, the 8th generation of Rokubei continues to make pottery. 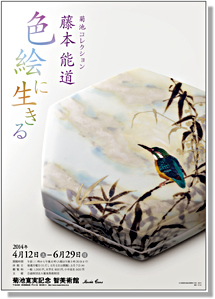 - the highest appraised market value of art was over 6,000,000 JPY (1st Rokube). Starting when he was 19, he spent three years as an assistant to Kenkichi Tomimoto in Nara. He established his own studio in the same area when he was 22. There he devoted himself to refining his artistic vision and perfecting his technique. 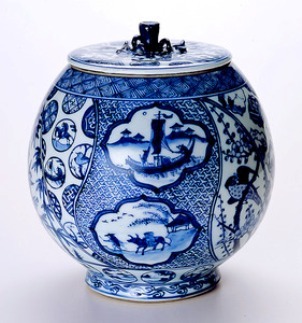 Thus he was able to reach new heights in his work and gained a reputation as the finest master of the blue and white porcelain known as sometsuke. Committee chairman of the Japan Society of Oriental Ceramic Studies and board chairman of the Japan Kogei Association. After leaving university mid term, he devoted himself to the study of ceramics at Seto and Kyoto, and established himself as a potter in 1925. However, in 1930 he became an Oriental Ceramics Research Institute employee, suspending his pottery work to devote himself to ceramics and porcelain research. In 1941 he served at the Tokyo Imperial Household Museum, joining in with the work of selecting Designated Cultural Properties. After retiring from the museum in 1961, he started to make pottery again from 1964, and opened a kiln in Toki city, Tochigi prefecture in 1972, producing various works based on existing research into ancient ceramics, such as Karatsu, Bizen, Aoji, and Akae wares. He left behind numerous achievements in modern ceramics research, both as board chairman of the Japan Kogei Association established due to the success of his name, and while working as a committee member for the Japan Society of Oriental Ceramic Studies and so on. His exact dates of birth and death, as well as his birthplace, remain unknown, but he learned pottery from Otagaki Rengetsu and ghostwrote for her during her lifetime. 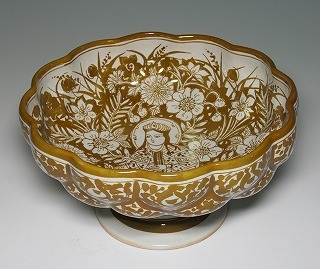 But after her death, from around 1878, he primarily produced shrine offering bowls and so on, naming himself Rengetsu II. 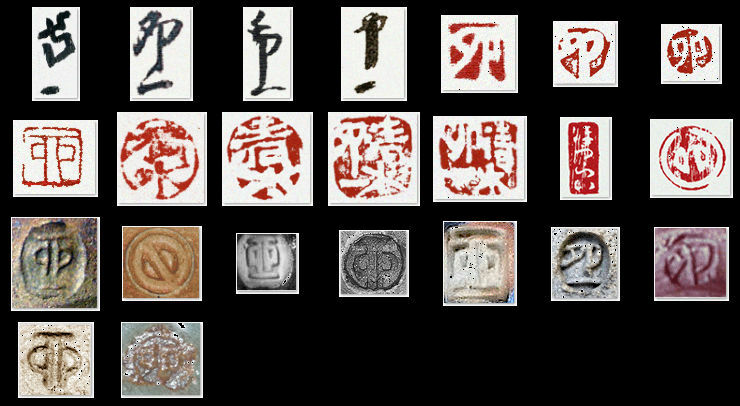 From around this time he also used "Koryo san" as his unique pottery seal. 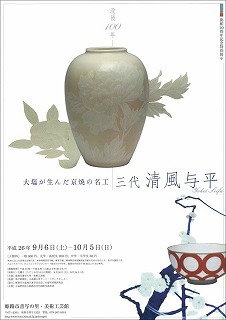 Potter and hakuji (white porcelain) artist born in Tottori prefecture. Acknowledged as a Preserver of the Important Intangible Cultural Property hakuji (a Living National Treasure) in 2013. After graduating from university, he was inaugurated as 24th chief priest of the Tsukiso Jodo Temple in Kasama, Ibaraki prefecture in 1957. In 1959, he began restoring the old kiln at the temple's gate, conducting unique research into ancient pottery from China, Korea and Japan. Further, from 1967 he received training from Tamura Koichi, dedicating himself to the study of Chinese kneading and inlaying techniques in particular. He first exhibited "Renjo te obachi" at the 9th Traditional Kogei Exhibition, receiving an honorable mention award. Thereafter, he amassed displays at every exhibition, and repeatedly amassed various awards such as the Japan Kogei Association's Presidential Prize in 1971, the Japan Ceramic Art Exhibition's top prize in 1973, the 1974 Japan Ceramics Society Prize, the 1975 Japan Traditional Kogei Exhibition NHK Members' Prize, the 1986 Fujiwara Kei Memorial Award, a Medal with Purple Ribbon in 1988, the 1990 Japan Ceramics Society first prize, and the 1991 MOA Okada Mokichi grand prize. In 1993 he was acknowledged as a Preserver of Important Intangible Cultural Properties (a Living National Treasure). At first he experimented with natural glazes and denaturing, but gradually Chinese Shu dynasty ceramics left a deep impression on him. 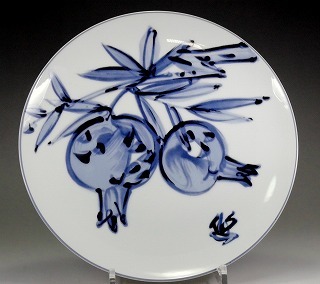 He sought out the most unique of these ceramics' kneading techniques, and also developed original works in a modern style using numerous glazes, which are highly valued for the beauty of their coloring. Born with a family background of Miura Kohei as his father and the third generation Miura Jozan, a mumyoi ware pottery artist, as his grandfather, Miura Koheiji also aspired to be a pottery artist and studied under Kato Hajime of Seto ware while attending school. In 1961, he was selected for a prize for the first time in the Fourth New Japan Fine Arts Exhibition, but from that point onward he continued to receive awards in various exhibitions, primarily in the Japan Traditional Kogei Exhibitions. His main awards include the Asahi Shimbunsha Award in the Japan Ceramic Art Exhibition in 1962, an award of excellence in the Traditional Kogei New Works Exhibition in 1967, the Ministry of Education Award in the Japan Traditional Kogei Exhibition in 1976, the Japan Ceramics Society Award in 1977, the Japan Ceramics Society Gold Award in 1993, the Grand Prize at the MOA Okada Mokichi Awards Exhibition in 1994, the Japan Kogei Association Holder Award in the Japan Traditional Kogei Exhibition and the Niigata Nippo Culture Award in 1995 and the Medal with Purple Ribbon in 1996. He was acknowledged as a Nationally Designated Important Intangible Cultural Property (Living National Treasure) in 1997. He founded a world of art brimming with poetic sentiment with works of his original pale celadon glaze poured onto mumyoi pottery clay to make artificial penetrations and then adding akae ceramic decorations. His traditional mumyoi techniques and contemporary color formation has been rated highly both in and out of the country, and he has had many public performances and private exhibitions overseas as well. He was born as a child of the 9th Miwa Kyusetsu (Setudo) of the Miwa Kiln of the traditional Hagi Pottery. After he had been disciplined and influenced by his father and his grandfather (the 8th Kyusetsu: Setsuzan), he inherited his family business and in 1927 he inherited the professional name as the 10th Kyusetsu. He has worshiped and adored works of generations of Kyusetu, and devoted himself to the research of kaolin. 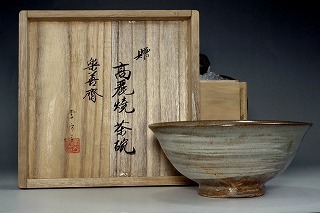 Eventually he combined the Hagi clay and white glaze to complete the unique glaze called "Kyusetsujiro". He has also added the character of pottery used at Japanese tea ceremonies to the Korian Korai Dynasty's transfer ware to achieve his own subtle style. Thus, he developed a new personality in the Hagi pottery world and made the foundation for the prosperity of Hagi Pottery today. After World War ll, he enthusiastically continued to present his works and won many prizes in the contemporary ceramic art exhibitions and the traditional craft exhibitions. In 1961 he was elected as the president of Hagi Pottery Ceramic Association. In 1964 he was certified as a person of cultural merit of the Yamaguchi Prefecture. In 1967 he handed down Kyusetsu to his younger brother and he changed his professional name to "Kyuwa" in his retirement. In 1970, during his later life, he was accredited for his achievements and received recognition as a holder of important intangible cultural heritage (a human national treasure). Born the third son of the Miwa kiln's ninth generation Kyusetsu (Setsudo) of Hagi ware tradition, Miwa Kyusetsu studied under his father and older brother (the 10th generation Kyusetsu: Kyuwa) after graduating middle school, and also studied under Kawakita Handeishi. After a long period of training, he took on the pottery artist name "Kyu" and displayed his work in 1955. He was chosen for a prize for the first time in the Fourth Japan Traditional Kogei Exhibition in 1957, and he continued to be chosen for prizes from that point onward. In 1960, he was nominated for member of the Japan Kogei Association. In 1967, following the voluntary retirement of his older brother, the 10th generation Kyusetsu, he succeeded the name as the 11th generation Miwa Kyusetsu. After that, he received the Medal with Purple Ribbon in 1976 and the Fourth Class Order of the Sacred Treasure in 1982. He was acknowledged as a Yamaguchi Prefectural Preserver of Intangible Cultural Property in 1972 and a Nationally Designated Preserver of Important Intangible Cultural Property in 1983, both for his techniques in Hagi ware. He skilfully inherited the traditional korai pottery art and the "Kyusetsu White" glaze style created by his older brother. Furthermore, he developed an openhearted, daring way of making pottery called "Onihagi," which he himself invented during his long period of training, clearly expressing his individuality as the 11th generation Miwa Kyusetsu. He gave his name to Ryusaku and retired, making his pottery artist name "Jusetsu" and continuing to vigorously make pottery. He passed away due to old age on December 11th. Born in Kitaoji-cho, Kamigamo in Kyoto in 1883 (Meiji 16). Rosanjin's birth was a result of his mother having an affair and his father, disgusted by this, committed seppuku suicide 4 months before Rosanjin was born. He had a poverty-stricken childhood and was put into foster care as soon as he was born, being passed on to various loveless adoptive households where he suffered abuse until he settled into the Fukuda household at age 6. One day, while running an errand for the place where he worked, he saw the sign for a restaurant in town called 'Kamemasa' on a paper lantern. The sign bore a picture of a tortoise and some letters drawn in a single brush stroke without the brush leaving the paper, and it captivated him, heightening his curiosity towards art. The man who drew this sign was Takeuchi Seiho, the eldest son of Kamemasa's owner who would go onto become the leading figure of Kyoto's circle of artists that dominated the Teiten and Bunten exhibitions. In 1905 (Meiji 38), he became a private apprentice to calligraphy artist Okamoto Katei (grandfather of Western style painter, Okamoto Taro) and lived with him for three years. There, he was given the name Fukuda Kaitsu, and over time he gradually began to receive more orders for his work than Katei. In 1907, he became independent from Katei as Fukuda Ōtei. His work prospered and he spent his earnings on calligraphy tools, antiques and dining away from home. On December, 1910, he traveled to Korea and lived there for three years, working as a clerk in the Printing Bureau of Korea's Administrative Agency. 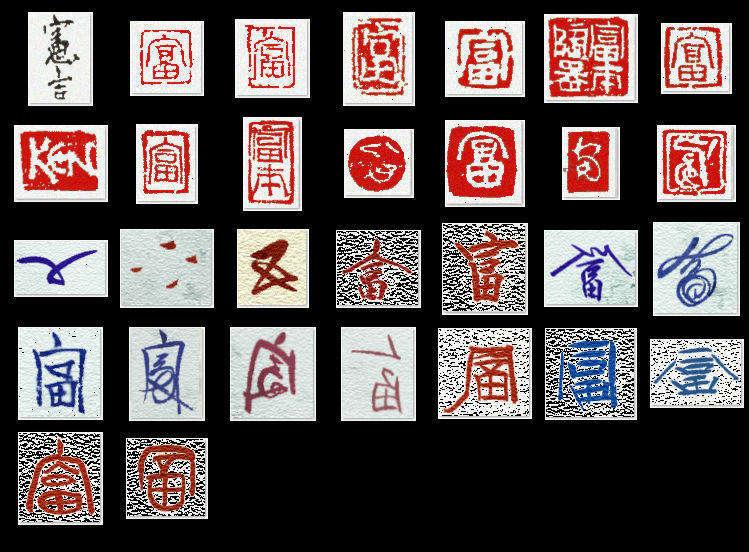 After staying in Seoul for just under a year, he headed towards Shanghai, where he met Wu Changshuo, who was well-known for being the best in the generation in calligraphy, art and seal engraving. He returned to Japan in the summer of 1912. Half a year later, he was invited as a dining guest by the wealthy Koji Toyokichi of Nagahama and was proposed a place where he can devote himself to calligraphy and seal engraving. Now under the name Fukuda Taikan, he left in Nagahama various masterpieces such as ceiling paintings in small pavilions, paintings on fusuma sliding doors and name engravings. Then, his wish to become the dining guest for the Shibata household which was frequently visited by Takeuchi Seiho, who he admired and respected, was granted and he requested to make a name engraving for Seiho. Seiho took a liking to his engraving and introduced him to people under his tutelage such as Tsuchida Bakusen, making him increasingly well-known as he became acquainted with the masters of Japan's circle of artists. In 1917 (Taisho 6), he became acquainted with Benrido's Nakamura Takeshiro and the two became good friends, afterwards running the antique store Taigado together. Taigado then began to serve regular visitors food made from high-quality ingredients served in the antique pottery in the store, and a diner made especially for those with a membership called 'Bishoku Kurabu' was started in 1921 (Taisho 10). Rosanjin himself stood in the kitchen and cooked, and also made the works of pottery used in serving the food. On March 20th, 1925 (Taisho 14), Rosanjin, along with Nakamura, borrowed 'Hoshigaoka-saryo restaurant' in Nagatacho, Tokyo and started a high-quality restaurant open only to those with a membership, with Nakamura as the owner and Rosajin as an advisor. In 1927 (Showa 2), he invited people ranging from potter Miyanaga Tozan and Arakawa Toyozo to Yamasaki, Kamakura and established a place to research ceramics, Seikoyo, and began working on pottery in earnest. After the war, he was economically impoverished and lived a life of adversity, but in 1946 (Showa 21), he opened a direct sales store for his own work in Ginza called 'Kadokadobibo' and gained positive feedback, even from Western people staying in Japan as well. In 1954 (Showa 29), under the invitation from the Rockefeller Foundation, he held exhibitions and lectures in various areas in the West, and also visited Pablo Picasso and Marc Chagall. In 1955 (Showa 30), his Oribe ware designated him as a Preserver of Important Intangible Cultural Properties (Living National Treasure), but he refused this title. He passed away at Yokohama City University Hospital due to liver cirrhosis in 1959 (Showa 34). Became a potter aged 24 on the advice of his then boss. Went on to build his own bamboo climbing kiln (Jizenbogama) in 1982, after training under Inoue Toya at Kyozangama in Karatsu for three years. Following this, he mostly showcased his work in solo exhibitions, including at Shibuya Kurodatoen in 1985, and at the Odakyu Department Store the same year. 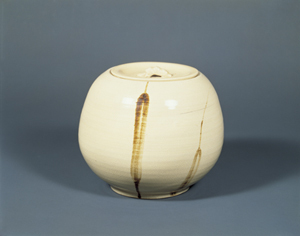 Nakagawa developed a style of pottery that was unbound by convention, yet respectful of the traditional techniques of Karatsu-ware, such as brush-decorated, mottled, Korean, and brushed slip. He mainly specialized in the production of tea bowls. 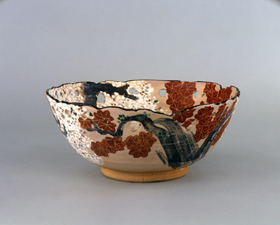 In 2000, he succeeded in recreating a tea bowl in the old Okugorai style of Karatsu-ware, and became known as an artist to watch. He died at the age of 58. He was born on October 1st as the son of Shigeto, his father who had inherited the Nakajima Pottery. After graduating middle school, he helped with the family business. Around this time, his older brother, Takashi, graduated from the Kyoto Institute of Technology and came home, and he began to include avant-garde creations at Nakajima Pottery. 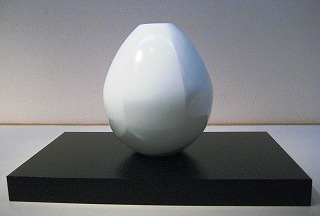 In 1965, his "Transformed White Porcelain Pot" received an award in the Saga Prefecture Exhibition. Furthermore, in 1969, when he was around 28 years of age, he built the "Yumino kiln" in the semi below ground style on the remains of the old Yumino kiln, and became independent. From that point onward, he devoted himself to celadon, showing activity such as receiving prizes, starting with the Encouragement Award in the Japan Traditional Kogei Exhibition in 1977, then the Prime Minister Award in the First Western Japan Ceramic Exhibition in 1981, the Japan Ceramics Society Award in 1983, the MOA Okada Mokichi Grand Prize, the Fujiwara Kei Commemorative Award and the Saga Shimbun Cultural Award in 1996. During that time, he also received acknowledgment as a Saga Prefectural Designated Important Intangible Cultural Property in 1990. When he first began producing works, he engaged in reproducing Chinese Song celadon. But as he researched old Korean kilns and Chinese Long Quan kilns, he aimed towards celadon that can express the life force of nature, and he established his own original "Nakajima celadon" with works such as those that combine the base material or unglazed parts for high-firing with the glazed parts, and those that have freely expressed penetrations. 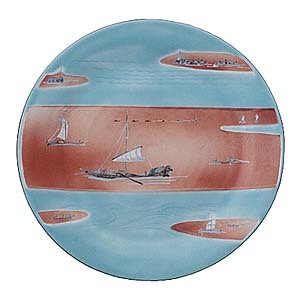 He also produced pink and purple works, using glaze containing a lot of iron and combining celadon and red glaze. 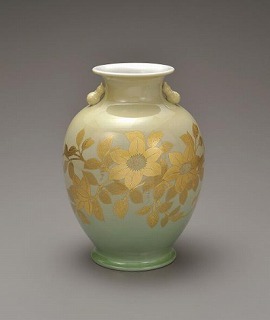 For contemporary works, he created rotai glaze, which expresses the celadon parts with shades of bitter orange or light green on a dark brown receptacle. 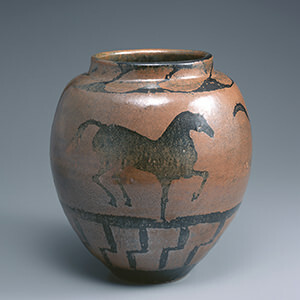 He used techniques such as vessel shaping, pottery carving and scraping, and developed in a wide field, from traditional shapes to the abstract. In 2007, he was appointed as a Nationally Designated Important Intangible Cultural Property (Living National Treasure) for celadon. Originally, he studied pottery under the 4th generation Dohachi in Kyoto, but he visited and trained in various regions throughout the country as well as Korea and China. Afterwards, he came to Nagoya due to an invitation from Takamatsu Sadaichi, a wealthy merchant there, and he began to create pottery in the same area. He often produced Raku ware and Joseon style tea pottery. He passed away due to illness at 62 years of age. Around the time of the second generation, Sokuchusai Sosa of the Omotesenke school, gave the name, Yagoto kiln. The fifth generation is currently active. Born January 7th. While studying under his father, he trained in the tea ceremony under the instruction of the tea master Yoshida Josei. In the year Showa 12, he was named successor to his father following his father's death. However, he discontinued his business in the year Showa 18 due to the war and, after training in the tea ceremony once again at Omotesenke, was given the name Yagotokama by the tea master Sokuchusai and began making pottery in the Raku style. He trained under the instruction of Morikawa Nyoshun'an and in the year Showa 40, he won a prize at the Tokai Traditional Crafts Exhibition for a black Raku-style tea bowl he displayed called Amagumo. After that, he was invited to various areas of Japan, including Daitokuji's Zuihoin and Chita's Koboji, to construct kilns and make tea bowls. More so than in his younger years, he grew close with people such as Masuda Don'no and Mingei potter Bernard Leach, beside whom he devoted himself to researching Raku wares and creating marvelous Koetsu reproduction tea bowls. He passed away in April at the age of 67. 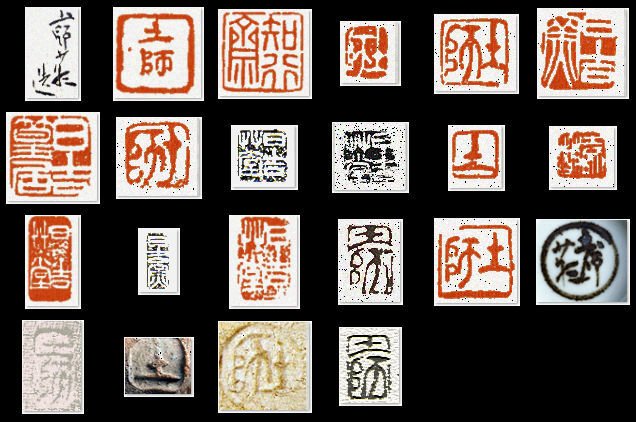 For his artist's seal, he continued to use his father's, as well as a hexagonal seal and a seal reading "Yagoto" written in cursive script. He was the second son of the 11th generation Taroemon, but his older brother went down a different path and Shigeo came to inherit the house. He gained a grasp of the basic rules of pottery at Arita Technical School, and then at Karatsu Kiln Industry Corporation and Karatsu Brick Corporation after graduation, where he worked as an engineer. After that, he temporarily became an adopted heir of the Mutsuro family, who were lumber dealers, but following his father's death in 1924, he succeeded the name as the 12th generation Taroemon in 1927, and in the following year of 1928, he reconstructed the Ochawan kiln that had been used since the feudal government era and built a new downdraft style coal kiln. Additionally, in 1929, he began the excavation of the old Karatsu kiln remains. From that point onward, he researched old Karatsu ware, which had died out for a long time, and endeavored to revive it, completing the beating technique and being acknowledged as an Intangible Cultural Property for Karatsu ware in 1955 and receiving the Medal with Purple Ribbon in 1967, the Fourth Class Order of the Sacred Treasure in 1969 and the Western Japan Culture Award in 1970. Furthermore, he was acknowledged as an Important Intangible Cultural Property (Living National Treasure) for Karatsu ware in 1976. Also, during this time, he entered the Buddhist priesthood at Daitokuji Temple in Kyoto, was bestowed the name: Muan, and retired in 1959. In the same year, he had his eldest son, Tadao, succeed the name as the 13th generation Nakazato Taroemon. From that point onward, he devoted himself to creating his original pottery. He was born the eldest son of Living National Treasure Nakazato Taroemon, and inherited the family business. The Nakazato family was for many generations entrusted with the official kiln of the Karatsu Domain. Aiming for a restoration of old Karatsu ware, along with his father and brother, Nakazato Shigetoshi, his works research a striking technique. This is done by turning the wheel slowly and holding wood in the center, while continuously striking the outside with a board. He passed away from chronic myelogenous leukemia on March 12, 2009. 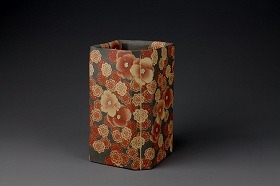 From 1953 he engaged in the study of ancient kilns used for Karatsu ware for 18 years. In 1971 he studied under Koyama Fujio and opened his own waritake climbing kiln, Kojiro kiln; in 1981, under the guidance of Arazawa Toyozo, he opened Koju kiln. In 1999 he opened Kaga Karatsu Tatsunokuchi Kiln in Ishikawa prefecture. After holding the exhibition "Kojiro Kiln Trio" at Gallery Dojima in 1996, he continued to hold solo exhibitions at the same gallery every year until his death in 2006; in that time he also held his "80th Birthday Exhibition" at the Nihonbashi Mitsukoshi in 1996. Because he was an independent artist, he does not have a particularly outstanding record of awards; however, he was one of the leading artists of modern Karatsu ware, and possessed enough skill to be called a "Karatsu expert" by Koyama Fujio. He was successful in the restoration of classical techniques such as brush decorated and mottled Karatsu and "kairagi" due to his long years of research of ancient Karatsu kilns. He specialized in tea bowls, and also presented richly textured scenes on rice bowls, vases and pitchers. 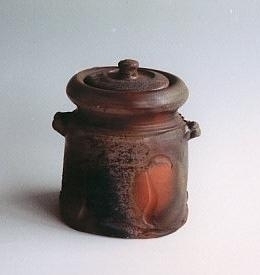 After leaving Tamba for the capital and studying at the Awataguchi pottery kiln, he learned techniques for tea caddies in Seto. After returning to the capital, he made ceramics in front of the gate of the Omura Ninnaji Temple. We handle supplies used at the same temple. His style used elegantly colored pottery fired with paintings. He established the modern mainstream Kyo ware style of Ninseiyaki. Additionally, he is considered to be the first potter who included not just the name of the kiln but the seal of the artist on his pottery. As for his pseudonym, "Nonomura" comes from his birthplace, while "Nin" was granted to him by Ninnaji Temple; "sei" comes from his real name, "Seiemon," so he became "Nonomura Ninsei." Born the third son of Ogata Soken of Kariganeya, a kimono fabrics wholesaler in Kyoto, with Ogata Korin as one of his older brothers. He studied under Nonomura Ninsei, learning to create pottery. When he was around 37 years of age, he opened a kiln in Kiyotaki, right near the Ninsei Kiln, and as it was located in northwest Kyoto (which in Japanese, is referred to as the cardinal direction of "Inui", a word that can be pronounced as "Ken"), he inscribed the signature of "Kenzan" into his products since then. His style was influenced by Ninsei, his master, and Korin, his older brother, using many shades of color in the painted earthenware he produced. He also excelled in not only pottery, but art and writing as well, and he moved to Edo in his later years, gaining fame as a writer and pottery artist. The first generation Kenzan had no children or stepchildren. The name of Kenzan has been inherited by subsequent generations, but these successions are not based on blood relations or master to student relationships, and are only through people calling themselves by the name. The daughter of the sixth generation who was supposed to inherit the seventh generation, Ogata Kennyo, made arrangements with fellow older apprentice Bernard Leach and decided that the name of Kenzan will come to an end with the sixth generation in 1969. Up to 50 potters, researchers, authors, critics etc., concerned added their signatures of approval at the time. After that, Yamamoto Josen has declared himself as the eight generation Kenzan, but this has not been accepted by the Association in Honor of Kenzan. Said to have originally descended from the Haji family, who lived in Haji, Kawachi Province, he left for Kyoto at around 1656 and learned the method of producing Raku ware from Ichinyu of the Raku family. It is said that he took up residence near Nijo Kawaramachi, and for that reason it is conjectured that he had some sort of connection to the Oshikoji ware that the nearby Raku branch kiln fired at the time. In 1666, he served the Maeda family of the Kaga Domain, on the recommendation of Senso Soshitsu, who worked as a tea master for the Kaga Domain and was the fourth generation of the Urasenke tradition. Because he was granted a dwelling in Ohi Village on the eastern suburbs of Kanazawa by Kaga feudal lord, Maeda Tsunanori, he took on the surname Ohi straight from the village's name. Few works of the first generation Ohi exist in present day, but by looking at the tea bowl works that do, one can see a lack in elegance and a bland crafting field in the remaining works. However, there are disputes on whether this distinction was because of a lack of ingenuity in the initial techniques that made the pottery, or because the works were of Senso's preferences. But, as a certain amount of fine skill can be seen when looking at the sculpted ornaments, it is surmised that a large part of it is due to Senso's preferences. 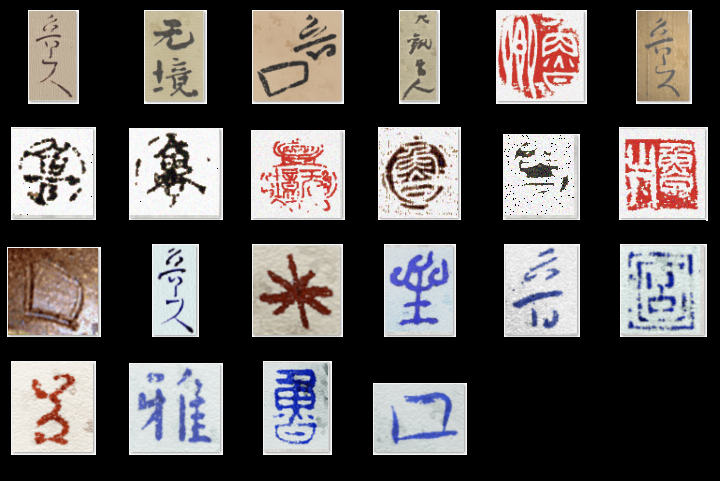 Also, while it is said that there are a few rare tea bowls inscribed with a signature, most of them do not have one. Overlapping with the new Meiji period, in the time when not only Ohi ware but tea pottery culture was in decline throughout the country, both the eldest and second eldest sons of the seventh generation Michitada (Chozaemon) did not pursue the family business and left the house, which caused Michitada's cousin, Nara Rikichi, to enter the Ohi family and succeed the family name and estate. After succeeding the name, he produced works thoroughly adhering to traditional pottery techniques while also adding his own originality. He overcame the tumultuous Meiji period and carried on to the prosperity of Ohi ware. Also, he received the name: Shoto by Shoun, an old priest of Daitokuji Temple, and the name: Igensai by Master Ennosai, the 13th Head of the Urasenke tradition. After graduating from Ishikawa Technical School, he devoted himself to the family business, and he was chosen for a prize for the first time in the Ministry of Agriculture and Commerce Kogei Exhibition in 1920. In 1925, he inherited the family estate and succeeded the name as the ninth generation Ohi Chozaemon. He earnestly studied traditional pottery techniques, and received high praise at his private exhibition, "Twelve Months Tea Bowl Exhibition," in 1936. In 1940, he was bestowed the Chozaemon sign from Konoe Fumimaro, and he was acknowledged as a Preserver of Kogei Techniques in 1942. From 1958, he continued to display his works and be chosen for prizes in the Japan Traditional Kogei Exhibitions. 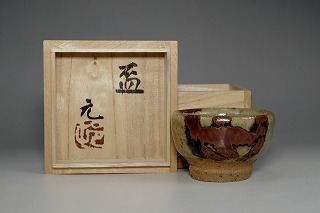 Starting with makugusuri glaze black tea bowls and ameyu glaze tea bowls, he specialized in producing tea pottery. He contributed greatly to the establishment of Ohi ware from the Showa period onward, and was known as an especially skilled craftsman, even among the Chozaemon line. As the 10th generation Ohi Chozaemon, he inherited the Ohi ware family business, which was a traditional method of producing tea pottery from the feudal government period. On the side, he presented and displayed works that had adopted a modern feel in exhibitions, mainly the Japan Fine Arts Exhibition. He continued to be chosen for prizes and receive awards, becoming active as a central artisan in the Japan Fine Arts Exhibition. He uses the name, "10th Generation Ohi Chozaemon" for his traditional Ohi ware works. However, he uses the name he had before his succession as it is, "Ohi Toshiro," on works such as the ones he displays in the Japan Fine Arts Exhibition and other related works, using the two names apart from each other. Maruya Moemon was born to a family that had run a pawn shop in Kyoto for generations. He ran the family business until he was 35, when he left it to his son in order to pursue his passion for pottery. He built a kiln on the grounds of Kennin-ji temple, and began making unique ceramics. From 1781-1789 he succeeded in creating the first pieces of Kyo ware. He along with his understudy, Aoki Mokubei, and second generation of understudies, Takahashi Dohachi and Ogata Shuhei, are considered the fathers of Kyo ware ceramics. His most famous products were Gosuakae, but other than that Sometsuke, and Koji ware are among his eminent works. 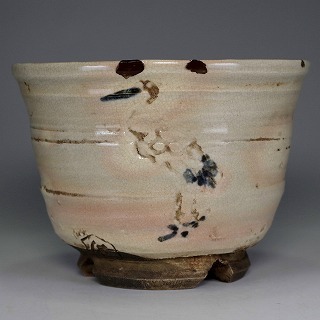 He made a wide variety of ceramics including dishes and various ceramics for use in daily life, as well as tea utensils, teapots, and other sencha tools. 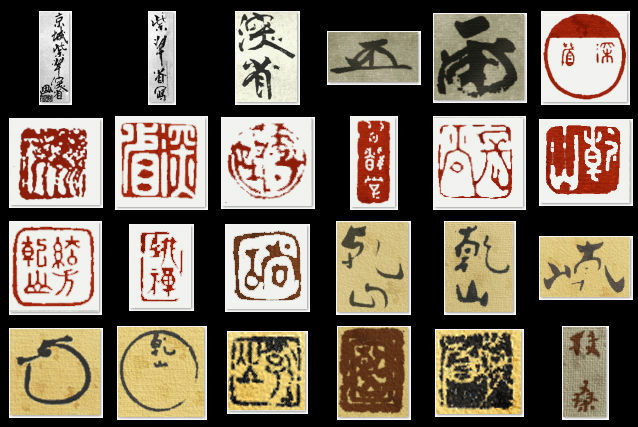 Furthermore, seals of engraved signatures such as "Eisen" and "Riku Katayama" from this time period still exist, but there are currently no existing ceramics with Maruya Moemon's seal. Because of this, he is thought to have not used a seal. A son of Ayame and Hikuni, he was the founder of Raku style of pottery (Raku ware), which was hand molded without the use of a pottery wheel. He made the Raku pottery studio with Tanaka Soke, as well as Joke and Somi who were Soke’s sons. It is said that Chojiro’s wife was Somi’s daughter. Chojiro made a new style of pottery, which was inspired by the ideas of Rikyu, famous amongst the general public. 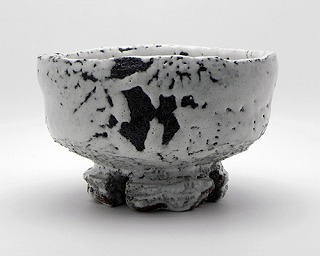 This work is also known as “raku chawan“ (hand molded tea bowl) with its origins stemming from Raku pottery. 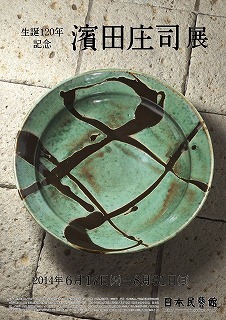 Raku ware has its roots in a firing technique of Chinese (Ming dynasty) tri-colored glazed pottery, which has green, yellow, sky blue and brown colored glaze. However, Chojiro stopped using such colors in his works. His chawan just has black or red glaze, emphasizing the color of Juraku red clay. You can see Rikyu’s style reflected in Chojiro’s monotone color works. The tea bowls were the avant-garde of the time. Chojiro came up with new standards of value, unintended beauty, by reducing the number of ornaments and luxuriousness to the utmost limit in the works. Nobody knows when Chojiro started making chawan, however, an old document titled ‘Tennojiya-kaki (1580) (a record of a tea ceremony meeting)’ mentions ‘hatanosoritatsu-chawan’, meaning the outwardly flared (everted) lip or rim of a tea bowl, which is considered to be an aka-raku (red-glazed) chawan named ‘Doseiji’ made by Chojiro. Furthermore, there is a mention of ‘Soeki (Sen no Rikyu)-gata (shape) no (of) chawan (tea bowl) (shape of Soeki like)’ in a scene of a tea ceremony party hosted by the tea ceremony master Nakabo Gengo in an old document ‘Matsuya-kaiki’ from 1586, which is considered to be chawan made by Chojiro. However, the record appeared one time only. 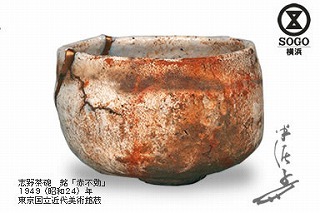 Subsequently, Chojiro’s chawan started being referred to as ‘Imayaki chawan (modern tea bowl)’, ‘Juraku-yaki chawan (tea bowl made of Juraku clay)’ in the document. It is considered that Chojiro’s works became famous amongst the general public around the year. Although many of Chojiro’s works were chawan, he also made flat bowls, incense burners, shishi statues and etc, however, they were very rare. aka raku chawan ‘muichimotsu’ and ‘tarobo’. 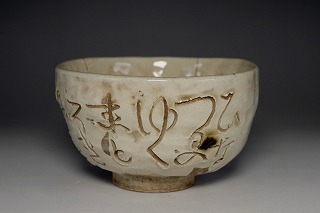 On the other hand, there was an asymmetrical type, breaking the balance between the right and left side of the bowl intentionally like kuro raku chawan ‘shunkan’ and `omokage`. 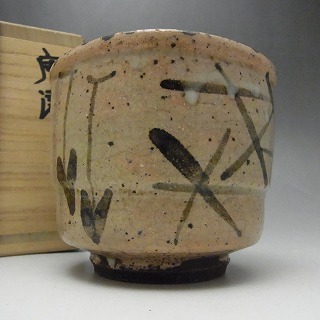 In addition, there were kuro raku chawan, for example `mukiguri`, which has a square shape between the rim and the hip (near the bottom) and Aka raku chawan, like ‘dojoji’, which is made in a similar style to Koetsu’s art. 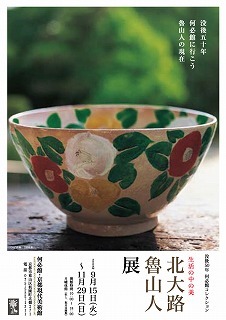 Chojiro’s family was working at his raku pottery studio, however, Chojiro did not put his signature on his works. It is difficult to distinguish Chojiro’s own works from his family’s. Therefore Sokei’s and Jokei’s works were considered Chojiro’s works as well. This is why there exist different types of chawan. Sons of Tanaka Sokei, Somi and Shozaemon were Jokei’s brothers. Jokei was running the raku pottery studio with Chojiro, Sokei and Somi. There, he taught Honami Koetsu, the method of making raku ware. It is considered that the success of Jokei’s works appeared after the death of Chojiro, establishing the solid foundations of raku ware, which are carried through to the present day and the fame of the raku family name. The rapport between the families of Rikyu, Chojiro and Sokei continued even after the seppuku (ritual suicide) of Rikyu. After the death of Rikyu, Shoan, a son of Rikyu, and the Toyotomi government took him into custody in the Aizu area. It is believed that Jokei went to pick him up from Aizu when the government granted Shoan bail. Not long after, Shoan revived ‘Senke’, the tea ceremony school. On the other hand, Joke established the Raku family name. Thanks to Honami Koetsu’s talks with the Tokugawa general family, the Tokugawa and Raku families created close ties. Tokugawa the 2nd Hidetada gave Jokei the word of ‘Raku’ as his family name, then Jokei made ‘raku’ seals, using them as his pottery mark. Because of these reasons, the successive Raku family head took over ‘Kichizaemon’, Jokei’s artist name. 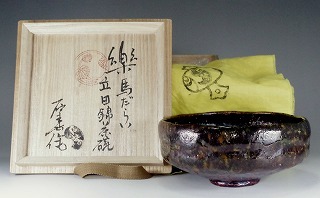 Jokei began to make his own new style based on Chojiro’s Rikyu-style tea bowls. At that time, Furuta Oribe, who was one of the Rikyu-Nanatetsu, the seven disciples of Sen no Rikyu, was the most famous tea ceremony master. Tea bowls made by Oribe had a bold distorted shape or decorativeness. It was the exact opposite to the Rikyu style. 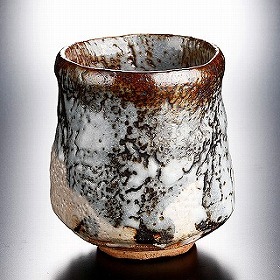 Jokei was quick incorporate Oribe’s style into his art, making raku chawan have a distorted shape or decorativeness as well. He also invented Koro-yu, a Jokei-style white glaze. It was preferably used as a glaze for ”koro” (incense burner). 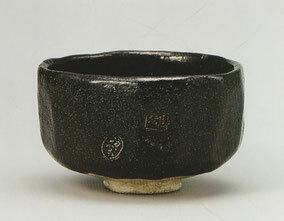 Jokei’s black glaze, called “kase-yu”, has a smooth or mat black color like Chojiro’s glaze. Most of Jokei’s chawan was unglazed around the “Kodai” (foot of the tea bowl) which is called “tsuchi-mise“ (~clay look), and does not have a “Tokin” (sharp point) in the center of the “Kodai”, although lots of Chojiro’s chawan have a “Tokin”. Donyu, who was Jokei’s first son (Doraku being the 2nd) and a 2nd generation Raku-family descendant, went by the pseudonym or artist name Kichibe or Kichizaemon during his life, however, many people call him by his nickname ‘Nonko’. Nobody clearly knows when Donyu began pottery making, however, he had enough time to learn pottery from his father, Jokei, and it’s thought that he also learned it from Honami Koetsu (a famous potter). Donyu tried to develop a new raku ware style based on Rikyu-style tea bowls while incorporating his style and early Edo period trends. It was considered that Koetsu developed the art style of Donyu. 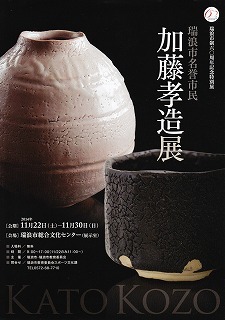 The document ‘Honamikojoki’, written by Kosa, who was Koetsu’s adopted child, and Koho, Koetsu’s grandson, says that Donyu was the best potter, having exceptional skills and being a descendant of the Raku family, handed his tea bowls down to his offspring for them to learn the Raku family craft. The document tells that Koetsu had a high opinion of Donyu. However, it was difficult for Donyu to overcome his financial difficulties even though he was the best potter because the Raku pottery workshop was not oficial pottery workshop of Tokugawa during the feudal times. There are clear differences between Chojiro’s tea bowls and Donyu’s tea bowls. Chojiro’s tea bowls have a mat black glaze, on the other hand many of Donyu’s tea bowls have a glossy black glaze and are sometimes furnished with ornaments. Donyu’s tea bowls are also bigger, however, thinner than Chojiro’s tea bowls. Chojiro’ bowls seem serious, modest and reserved, without flashy decorations while having a consistent form. On the other hand, Donyu’s tea bowls impress one with a sense of freedom in terms of artistic expression and flashiness, as Donyu likes to decorate his bowls and make them stand out. There is an opinion that the nickname ‘Nonko’ originated from a flower vase which was gifted to Donyu from Sen no Sotan (a grandson of Sen no Rikyu). Sotan named the vase Nonko (possible meaning: self‐renunciation). Every time he went to visit Donyu, he would say ‘I am going to see Nonko’, which might mean that Nonko was his nickname for Donyu. It is also said the nickname ‘Nonko’ originated from the early Edo period hairstyle trend ‘nonko’. The son of the Third. Named Saheei, later Kichizaemon. He tried to follow the First in style, while incorporating his father's techniques. A glossy shine found within subdued colors is characteristic of his style. The son of Kariganeya Sanemon, son-in-law of the Fourth. Named Heishiro, later Soukichi. Succeeded to the name Kichizaemon when he was 28. Pushed further towards a return to the style of Chojiro. The second son of Yamatoya Kaheei, the son-in-law of the Fifth. He had a reputation for the Koetsu Utsushi (to make copy of Koetsu art) technique. His famous work is Sanyu Nihyaku. The first son of the Seventh. He succeeded in name with his father's retirement in 1852, but due to health issues, he leaves the headship of the family to his younger brother and retires, changing his name to Saheei. He continued to create, but passed away at the young age of 30. On the 25th anniversary of his death, the name Tokunyu was bestowed on him again, making him officially part of the successive generations. The second son of the Ninth. He inherited headship of the family in 1811. Along with the Ninth of Omote Senke, he waited upon the Kishu Tokugawa family. Contributed to the development of the Kairakuen kiln. Afterwards he contributed to the establishment of the Nishonomaru Oniwayaki and Minato Goten Seineiken kiln. For these achievement he is bestowed the Raku name from Tokugawa Harutomi. His style incorporates elements of Oribeyaki, Igayaki and Setoyaki and is known to be virtuosic and flamboyant. The first son of the Eleventh. Inherited the family headship in 1871, but due to a period of deterioration for tea ceremonies. There are very few works from when he was young, but he produced many works later in his life. He retired in 1919 and led an elegant life henceforth, going back and forth between his main residence in Kyoto and the villa of the Ninth in Ishiyama in the Shiga prefecture. The first son of the Twelveth. He researched glazes and techniques more than anyone of the family and also did research on the Raku family history. Between 1935 -1945, he published these results in a magazine called "Sado seseragi." However, in his later years with the outbreak of the Second World War, his son was drafted and due to the shortage of resources his research and work became difficult. This forced him to shut the business down. During the process he passed away. The first son of the Thirteenth. Graduated 1940 from Tokyo Bijutsu Gakkou (presently Tokyo University of the Arts) from the sculpture department. Upon graduation, he was drafted into the army. In 1945, he made it back to Japan alive, however, his father had passed the previous year and the practice of tea ceremony was also at a low point. From 1960 onwards, when the economy started to improve, his work also thrived. The three dimensional construction which utilized theories from sculpture are known as a characteristic of his work that was not present in other generations. In 1978, he opened the Raku Museum using historic documents of the Raku family. 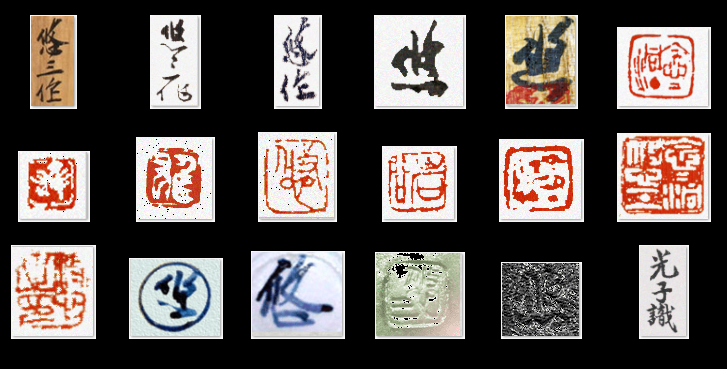 In the same year he was designated as an important intangible cultural property by the Agency of Cultural Affairs. While there were great expectations regarding his future, he passed away two years later. Real name Mitsuhiro. Graduated from Kyoto prefecture, Sujaku Highschool and Tokyo University of the Arts. He also studied at the Roma Accademia. Succeeded to the family name in November 1981. He has received many awards in and outside of Japan and has a reputation not just as a craftsman, but a 'ceramic artist.' In 1997, he received the Oribe award. She was consort of the crown prince of the former Empire of Korea and, during the Japanese era, was the first daughter of Prince Nashimoto Morimasa. Her Japanese name is Ri masako and Korean name is Yi Bangja. In her later years, she was naturalized in Korea and established education for disabled children and a cloisonné research institute, while devoting effort to ceramic art on the side. Due to those successes, the Korean government conferred upon her the "Order of the Peony" and, posthumously, the "Korean People's Order of the Rose of Sharon Prize, First Class." Following Toyotomi Hideyoshi's invasions of Korea, Mori Terumoto, who ruled the area of China at the time, brought back with him the brothers Li Shakko and Li Kei, who were Korean Joseon dynasty potters, when returning to Japan from Korea. The brothers built an official kiln in the castle town. Li Kei was the first generation of a lineage that inherited mainstream Hagi ware from generation to generation and worked at the official kiln of the Hagi Domain, alongside Miwa Kyusetsu's Miwa kiln. After Mori moved his castle to Hagi, he opened a kiln in Matsumoto Village of the castle town of Hagi, and was bestowed the name, "Koraizaemon" by the second generation feudal lord, Mori Tsunahiro. From that point onward, the name Saka Koraizaemon has been used since the first generation. As the 13th generation passed away in 2014, there is currently a vacant position in the lineage. Born the eldest son of the 13th generation Kakiemon, he learned pottery from his father as well as his grandfather (the 12th generation Kakiemon.) He was chosen for a prize for the first time in the 28th Issuikai Exhibition in 1966. He was also chosen for a prize for the first time in the First Western Japan Kogei Exhibition, which was newly established in the same year. From that point onward, he continued to display his works in the Saga Prefecture Exhibition and, from 1968, the Japan Traditional Kogei Exhibition. In 1971, he was nominated for full member of the Japan Kogei Association. Along with displaying works at exhibitions, he also vigorously took part in private exhibitions such as the Generation Exhibition and the Father and Child Exhibition, under the name Sakaida Masashi. He thoroughly researched traditional Kakiemon pottery painting and the nigoshide technique, and following the death of his father in 1982, he succeeded the name as the 14th generation Sakaida Kakiemon. From 1983 to 1984, he held Succession Commemoration Exhibitions in places such as department stores in various regions throughout Japan. Not limited to inside the country, he also started becoming active in holding private exhibitions in places such as America, Germany, Singapore, Russia and France. In the ninth year of the Keicho era (1604), brothers Li Shakko and Li Kei, who were Korean Joseon dynasty potters, were summoned under the orders of feudal lord Mori Terumoto, and opened an official kiln in the castle town. Out of the brothers, Li Shakko was the first generation of the potter lineage of Sakakura Shinbei. The family name was changed to Sakakura from the sixth generation. As the 12th generation Sakakura Shinbei spread Hagi ware throughout the country and saved it from falling into decline, he has been called a father of restoration. The current generation is the 15th generation. In 1905, Shoraku's grandfather, the Nishikide decoration master Kichinosuke Sasaki, opened the Shoraku Kiln in front of the gates of Kiyomizu-dera Temple with the plan of making raku ware, only to later relocate the business to the valley of Kameoka, Kyoto. The Shoraku Kiln has taught three generations up until now. Shouaku, the second oldest son, together with the the third oldest son, continues to make pottery while gathering research on raku ware. He is also active as the purveyor of Daitoku-ji Temple. Alhough born the son of a Kanazawa feudal retainer, Seifu Yohei aspired to be a potter. In 1815, he began his training under Takahashi Dohachi II (Nin'ami Dohachi) of Kyoto, and started out by constructing a kiln in Fushimi Momoyama for the production of Raku ware. Later, around 1828, Seifu Yohei moved his kiln to Gojo-zaka where he produced mainly gold-painted porcelain, illustrated porcelain, celadon, white porcelain, and blue-and-white ceramics. His greatest surviving works consist mostly of green tea wares. Then, in 1847, he became a ceramics instructor, following an invitation to the private kiln (producing Mushiake ware) of Igi Tadazumi (San'ensai), a fourteenth generation member of the Igi clan tea masters in Okayama Domain. Born into a ceramics wholesalers in Higashiyama, Kyoto, he aspired to be a pottery artist at around 15 years of age and studied under Ishiguro Munemaro. In 1951, he was chosen for a prize for the first time in the Seventh Japan Fine Arts Exhibition, and he displayed his works in the Japan Traditional Kogei Exhibition, which was newly started in 1955 and was presided over by the Japan Kogei Association. He received the Japan Kogei Association President Award of this exhibition in 1960. During this time, he also took part in the formation of societies such as the Shikokai society and Ryokutokai Society. In addition, he received awards such as the Asahi Award in the Contemporary Ceramic Art Exhibition in 1953, the Japan Ceramics Society Best Artisan Award in 1955, a Grand Prix in the Brussels International Exposition in 1958 and Top Prize in the Washington State International Ceramics Awards in 1963. In 1985 (60th year of the Showa period), he was acknowledged as a Nationally Designated Important Intangible Cultural Property (Living National Treasure) for iron glaze pottery, and he then received the Medal with Purple Ribbon in the same year. At the start, he produced works such as persimmon glaze, celadon, tenmoku, white glaze and iron glaze at his workshop in his home. However, in 1970, he newly opened a kiln in Horaicho, Shiga Prefecture. From that point onward, he founded works of Horai glaze, which is the molding blend of white glaze and black glaze (iron glaze). He showed a dignified domain in his craft, and was rated highly in both the fields of tea pottery and modern pottery. Born in the Meiji period, he started making pottery in Kyoto. In Year 14 of the Taisho period, he was given the name of Shoho by the Urasenke Tantansai family. He was also given the title of Josetsuan by the chief abbot of Daitokuji Temple. He is known for his expertise with national pottery and Korean replica pottery, and his clear-cut style has been much acclaimed. He has created many masterpieces, and is known as one of the master craftsmen of the modern era. His clear-cut style has been much acclaimed, and because he had a thorough knowledge of tea bowls, his works, which are neither too heavy nor too light, and which prioritize their ease of use, have been loved by many experts in the tea ceremony. Following his graduation from High School, Suzuki Osamu began employment at Maruko Toen where he researched such topics as glaze application. At this time he also assisted his father, who was a ceramics engineer, in producing works. Thereafter, he continued to produce works with his attention on the Japan Ceramic Art Exhibition and the Japan Folk Crafts Exhibition. 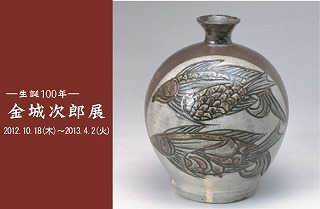 In 1959, he was first selected in the form of an honorable mention from the Japan Ceramic Art Exhibition. Then, in 1961, they awarded him the Award of Excellence of the First Degree. He was given his first award from the Japan Folk Crafts Exhibition in 1959. In 1961, he was given the NHK Award. In 1967, he received the Japan Kogei Association Chairman's Award. Further, he appeared in the 1962 Czech International Gallery of Ceramic Art and Design's Grand Prix. In 1963 he received the Toyama Prefecture Governor's Award at the Asahi Ceramic Art Exhibition. In 1965, he received the Gifu Prefecture Governor's Award. 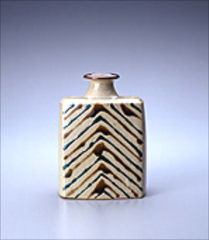 In 1968, he received the Japan Ceramic Society Award, then in 1982 the Japan Ceramic Society Gold Award. In 1987, he received a number of awards including the Gifu Shinbun Culture Award, the Chunichi Culture Award, the Award for Fine Arts, the Minister of Education Award, and Gifu Prefecture's Culture Award for the Fine Arts. 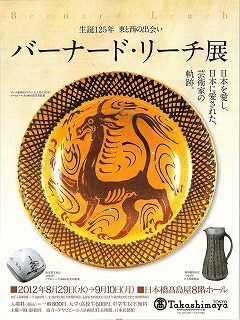 In 1992, he became a certified custodian of Tajimi City's Intangible Cultural Assets with relation to Shino ware. This was due to his history of public acknowledgments, and his role representing Japan's post-war era as a leader in contemporary Shino ware. In 1994, he was given national recognition as an intangible cultural asset (a living national treasure). In 1995 he was decorated the Medal with a Purple Ribbon. With repeated trial and error researching potter's clay and glaze, he went on producing ceramics with natural coexistence as his theme. In order to thoroughly provide color using Shino glaze and iron glaze, and through the principle of Yohen, he began using a gas oven. The red, thick iron glaze on the quiet white expresses the aesthetic Wabi Sabi, and with these he continues to announce the creation of new, elegant works. Born the second son of an Ise retainer, he visited Kyoto around the age of 25, and was inspired by seeing Awataguchi pottery. He took up residence and began making making pottery there. At first he studied Nanga techniques and fired decorated ceramics. 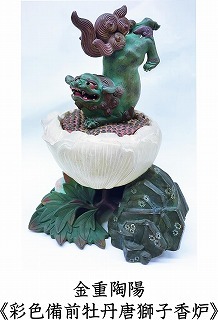 He specialized in ornaments of people and wildlife, but was also skilled at incense holders and tea bowls called shuki. He also left behind collaborations with master artists such as Ike no Taiga, Ueda Akinari and others. Although he was Takahashi Dohachi the second, he was commonly known as Ninami Dohachi. He was born as the second child of Takahashi Dohachi the first. Since his old brother died young, he took over the patrimony when he was 29 and opened a kiln in Gojozaka. He studied pottery under Okuda Eisen, Hozan Bunzou and so on. He was known as one of the experts of Kyo-yaki. He received the pseudonym of Nin from Ninnaji and Ami from Daigoji therefore, he called himself Ninami. He spread the technique of Kyo-yaki over the whole country. After graduating from Tokyo University of the Arts, he served as a teacher in Osaka for a while. He first became interested in ceramics around this time, but resigned due to his conscription. 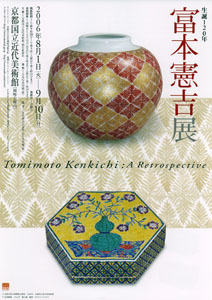 After WWII, he studied ceramics techniques in Kyoto under Tomimoto Kenkichi, then returned to his hometown, Tochinoki. In 1948 he took part in establishing Akami ware in Sano, Tochigi prefecture. The same year, he exhibited at the second Tochigi Art Festival, where he was noticed by Hamada Shoji. In 1950 he became a technical official for the Tochigi Prefectural Ceramics Coaching Center. In 1953 he opened his own kiln and began producing ceramics in earnest. Beginning with awards such as the Asahi newspaper company prize and the Matsuzakaya prize at the Japan Ceramic Art Exhibition in 1956, and the 1957 Japan Ceramics Society prize, he established a firm position as a ceramic artist, winning the Tomimoto prize at the 1961 Shinsho Association Exhibition, the Grand Prix prize at the 1967 Istanbul International Ceramics Exhibition, the 1970 Tochigi prefecture prize for cultural services, and another Japan Ceramics Society prize in 1975. In 1986 he was recognized as a Living National Treasure for his tetsu-e (iron glazed) ceramics. At first he produced works which applied tetsu-e ceramics painting to traditional iron glazes called kakiyu, kuroyu, and okatsuyu. 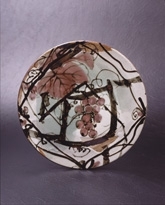 But beginning around the 1970s, he also expanded his tetsu-e techniques to cinnabar glazes and celadon porcelain works. 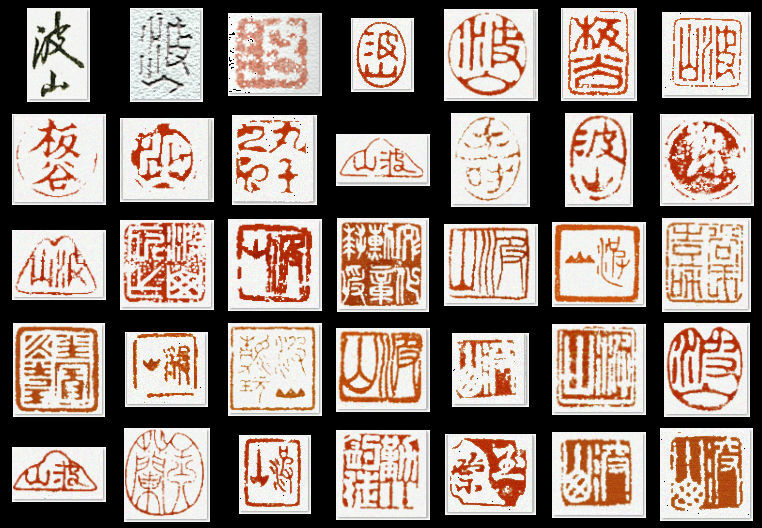 His unique tetsu-e techniques are a feature of every one of his works, but the glazes used in those works are to a certain extent references for research into the period they were produced in. Tamura's apprentice, Matsui Kosei, was himself also a Living National Treasure. At Matsumoto Sakame’s workshop, he studied such conventional techniques as those for making antiquated Kutani replications, Yoshida-ya replications, as well as the aka-e techniques. Following this, he created his characteristic Shinko glaze. He also taught such pupils as the second and third generation Yasokichis, along with Asakura Isokichi. As of today, he is renowned as a leader in dyed pottery figure glaze. In 1953, he became the first figure in Kutani ware to become designated as an Important Intangible Cultural Property (a Living National Treasure). His works became highly valued for being ceramics made with refined coloring techniques and precision, and are still traded for large sums on the market. After graduating from Tokyo School of Fine Arts’ Design Department, he gained the favor of Howard Leach, thus starting his aspirations to become a ceramic artist. The following year, he opened his own kiln in his hometown of Ando City. He began with a focus on hand-molden earthenware replicas and other earthenware, then proceeded to research Japanese antique kilns such as those of Shigaraki and Seto. 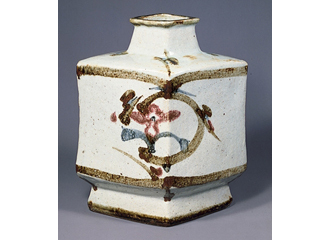 Further, he traveled to Korea and included Joseon dynasty pottery molding in his works. In 1927, he moved his kiln to Soshigaya, Tokyo, and had his works featured the following year in 1928 at the The Fine Arts Department of the National Artists’ Patrons’ Association. 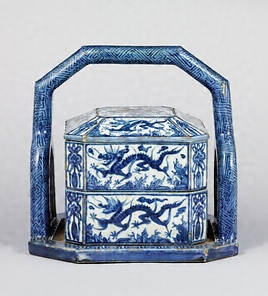 He would change the world of porcelain by mainstreaming the overglaze enamels, blue and white ceramics, and white porcelain of the Joseon dynasty replicas. In 1935, he became a member of the Imperial School of the Arts, in 1944 he became a professor at the Tokyo School of Fine Arts, and he would continue to assume a number of other positions. However, in post-war 1946, he retired from office, declaring his withdrawal even from the Artists’ Patrons’ Association. He thereafter resided in Kyoto. In 1947, he established the non-governmental Shinsyou Kougeikai (New Artisans Association of Fine Arts). In 1949, he once again took on pupils as a professor at the Kyoto Municipality Vocational School of Fine Arts (presently the Kyoto City University of Arts, which he became the president of in 1963). At this time, he also developed the ceramic paintings that would define his Tomimoto Style, making use of aka-e, sometsuke, and gold and silver pigmented striations. Moreover, he established a dignified literary style, announcing work after work which consistently combined utility with beauty and displayed a freedom of expression unique to molding. 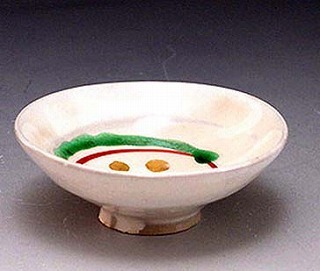 Then, in 1955, he became the first person to be designated an Important Intangible Cultural Property (Living National Treasure) in overglaze enamel porcelain making. In 1961, he received the Order of Cultural Merit. He was born the son of the seventh generation Tsukamoto Gennemon, a line of pottery manufacturers in Toki who had inherited the making of Chinese Dingyao style white porcelain from generation to generation for over 200 years. He held a strong interest in manufacturing pottery from a very young age, and assisted his father in making pottery after graduating from higher elementary school. After the war, he developed his craft activities through Hineno Sakuzo. Additionally, at around 1948, he gained the favor of Koyama Fujio, known for his research on Chinese ceramics, and pursued further research on Chinese Song dynasty celadon, white porcelain and blue and white porcelain, studying techniques in earnest. In 1961, he received the Ministry of International Trade and Industry Good Design Commendation with his pottery creations that brought out his crafting spirit. Furthermore, after being chosen for a prize for the first time in 1963, he showed activities mainly in displaying works at the Japan Traditional Kogei Exhibition, and he received many awards, such as the Gold Award in the America California Exposition in 1964, acknowledgment as a Gifu Prefectural Important Intangible Cultural Property in 1973, the Medal with Purple Ribbon in 1977, the Japan Ceramics Society Award in 1979 and the Chunichi Cultural Award in 1980. In 1983, he was acknowledged as a Nationally Designated Important Intangible Cultural Property (Living National Treasure), as a preserver of the techniques of Chinese Song dynasty Dingyao white porcelain and Jingdezhen blue and white porcelain. With a color formation that combines both the mystic beauty of Chinese porcelain and Japanese elegance, he expressed a decorative quality with sculpted floral patters made through distinguished spatula techniques, showing a highly dignified crafting domain. After graduating from Tamagawa University, he studied ceramics with the 12th and 13th Taro of Taro Nakazato Emon, a prominent family of Karatsu method, and Shigetoshi Nakazato. He entered many exhibitions, including the Kyoto Contemporary Crafts Exhibition, and in 1972, he created the open bamboo type kiln. 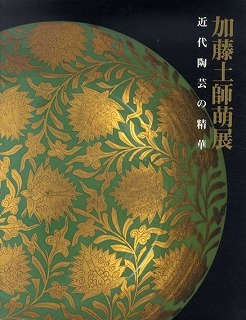 He also studied tea pottery under his father Shigenobu as well as Sozan Kaneshige, and he produced tea pottery works centered around Korean Karatsu and Egaratsu methods, exhibiting those works at Western Crafts Exhibition, Traditional Crafts Exhibiton, Nihonbashi Mitsukoshi, and Takashimaya Solo Exhibition. Born to a father who was a stone sculptor, and a mother who was a flower arranger, Nahiko's artistic sensibilities were nurtured from a young age. After graduating university, he encountered the pottery of Toyozo Arakawa, and was profoundly moved. This inspired him to recreate ancient Momoyama period kilns in Ooya, Gifu Prefecture (The Kiln of Heaven, The Kiln of Earth) and begin making ceramics. He also built kilns at Gotomaki Pass (The Kiln of Heart, The Kiln of Man), with 4 in existence. From the beginning he presented mainly solo exhibitions, with over 200 domestic exhibitions held to date, chiefly in major cities, and also overseas at the first and second Paris Onishino Exhibitions in 1988-89, where he received a favorable reception. Through his devotion to the craft, he developed a method of firing works over longer periods than Shino ceramics, and shocked the international ceramics world when he presented the creation of Onishino. He developed his highly creative vision of Onishino further with a harmony of bold molding and thick glazing that almost seems to swell with life force, and in recent years revealed a new artistic world by introducing elements such as gold leafing and Rimpa expression. Also, in addition to ceramics, he has gained a high reputation for presenting a unique artistic vision in other media, such as writing, painting, and copperplate engraving. He died on August 16th. Born the eldest son of the second generation Yamada Jozan, he studied under his father and grandfather, who was the first generation Jozan, while attending school, in order to inherit the family business. In 1947, after the death of the first generation, his father succeeded the name as Jozan, and Minoru took on the name his father used to have, Kojozan. In 1958, he was chosen for a prize for the first time in the Fifth Japan Traditional Kogei Exhibition, and he received the Grand Prix at the Brussels International Exposition in the same year. After receiving awards such as the First Class Asahi Prize in the Seventh Daily Life Kogei Exhibition in 1959, he was inaugurated as a full member of the Japan Kogei Association in 1962. In addition, he succeeded the name as the third generation Yamada Jozan from 1961, following the death of his father. He also started the Tokoname "Handcrafting Teapots Society" with other local pottery artists to hand over traditional Tokoname ware, assuming office as the society's president. Not content with tradition, he continued his research day by day, such as completing his original technique of firing a teapot with its lid still on with an old Tokoname anagama kiln, and then pouring natural glaze on top as it is. In 1994, he was acknowledged as an Aichi Prefectural Designated Preserver of Intangible Cultural Property, and he went on to be acknowledged as a Nationally Designated Important Intangible Cultural Property (Living National Treasure) in 1998. 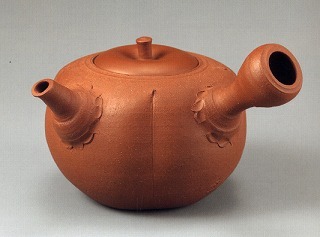 He excelled in the technique of producing teapots (mainly the type used for sencha tea) to the point that it is said that Tokoname shudei pottery is equatable to Yamada Jozan. He produced a wide range of works, from classical pieces to innovative works aligned with modern purposes, and it is said that there are over 100 designs that served as prototypes. 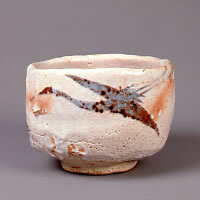 In addition, apart from teapot works, he has also left remarkable pieces such as sake cups, pots and large bowls. After graduating from elementary school, he began pottery in 1921 as a Bizen-ware pottery apprentice, then in 1933 he started his own independent kiln. In 1938 he became a student of Kusube Yaichi and trained in modeling and handling of the potter's wheel. In 1939 he won the Excellence Award at the Art Crafts Exhibition of Chugoku, Shikoku and Kyushu Regions, and in 1948 he was certified as a preserver of his characteristic technique which was based on the potter's wheel technique he learned from Yaichi, and had an added feeling of speed and sharpness. In 1954 he was recognized as a holder of Important Intangible Cultural Property from Okayama Prefecture and has also been selected as a member of the Japan Traditional Art Crafts Exhibition every year since 1955. He was appointed as a regular member in 1959 and won the Grand Prix of the Brussels Expo in the same year. In addition, he won multiple prizes such as the Okayama Prefectural Cultural Prize in 1972, Sanyo Shimbun Cultural Award and the Miki Memorial Award in 1975, Bizen City Achievement Award and the Purple Ribbon Medal in 1976, Mainichi Art Award in 1977, the Dark‐blue Ribbon Medal in 1981, the Order of the Sacred Treasure (4th class) in 1982. 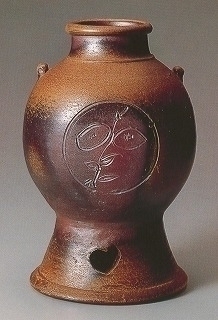 After his history of prizes awarded, in 1987 he was certified as a living national treasure for Bizen-ware, third in line after Kaneshige Toyo and Fujiwara Kei. 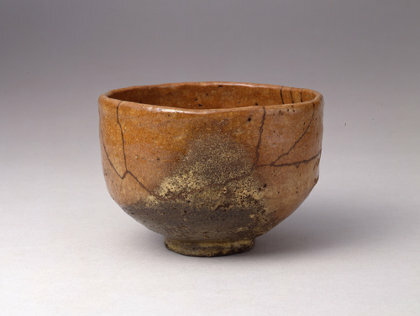 As mentioned above, with regard to his potter's wheel technique, he has a skill that can be said to be among the best of the generations of Bizen-ware artists. In his expertise in antique ceramics as well, he has contributed pieces overflowing with the elegance and deeply noble quality of traditional unglazed ceramics, especially tea caddies, tea bowls, mizuzashi (cold water container), etc. Born to a family with generations of gold leaf Kutani ware artists, he worked as a pottery artist apprentice under his grandfather after the early death of his father, and succeeded the three generation Kinzangama workshop in 1951. He was first selected to the Ishikawa Prefecture Art Exhibition in 1964, and flourished in many shows thereafter, appearing at the Issuikai Exhibition in 1978, being displayed at the Japan Industrial Arts Exhibition in 1974, winning the Issuikai award in 1978, receiving the 1982 member award, honorable mention at the 1984 Japan Industrial Arts Exhibition, being awarded the Takamatsunomiya memorial award in 1992, and recieving the Important Intangible Cultural Heritage award in 2000. Other awards in that time also include honorable mention at the China-Japan International Ceramics Exhibition in 1984 and 1985, Award of Excellence at the 1992 15th Traditional Kutani Ware Industrial Arts Exhibition, Intangible Cultural Asset nomination by Ishikawa prefecture, etc. Furthermore, in 2001 he was awarded the purple ribbon Japanese Medal of Honor, and designated a living national treasure for his Yurikinsai gold underpainting technique. The years around his designation as a living national treasure are marked by many brilliant successes such as the Northern Province Cultural Award, the Ishikawa Prefecture Cultural Merit Award, the 2002 Komatsu City Cultural Award, the 2003 Ishikawa Television Award, etc. Although he started by producing gold leaf Kutani wares under the guidance of his grandfather, he gradually deepened his study of Yurikinsai to find his own artistic style, creating pieces by applying yellow, blue, violet, etc. glazing to gold leaf. In recent years, he has been enhancing his formality and artistry by completing works embellished with an elegant grey glazed platinum leaf, as well as pieces finished with a thin gold glaze and layered with gold and platinum leaf.